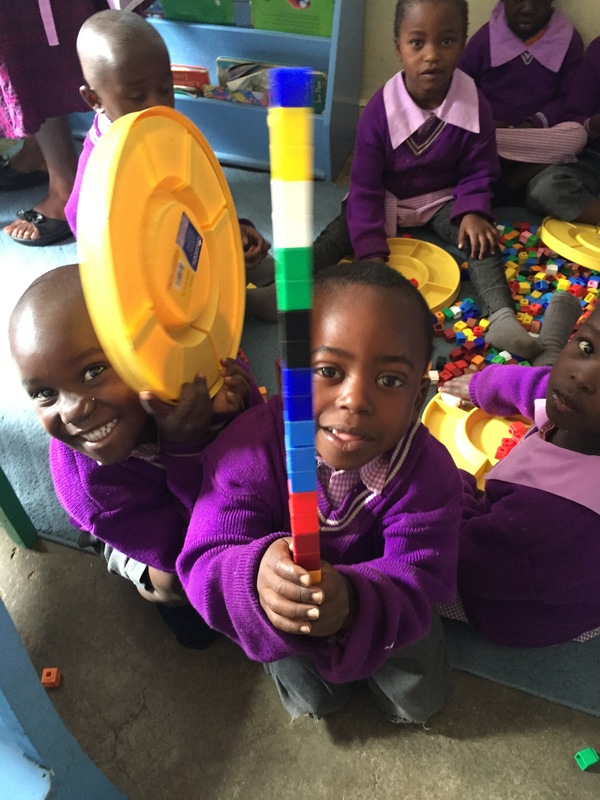 It is now a few weeks since we left our beloved teachers, helpers & friends in Nairobi. I’m happy to report that our classes are up and running and that everything seems to be continuing well without us! The phones have worked brilliantly and we get updates from each teacher each week. 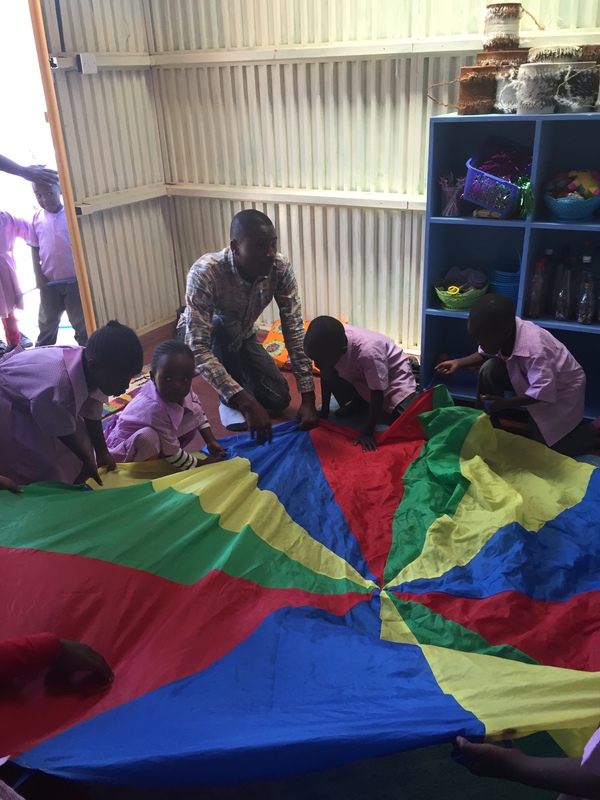 In turn, we send videos of classes here at home which are not only great for the Nairobi teachers but loved by the students there as well! 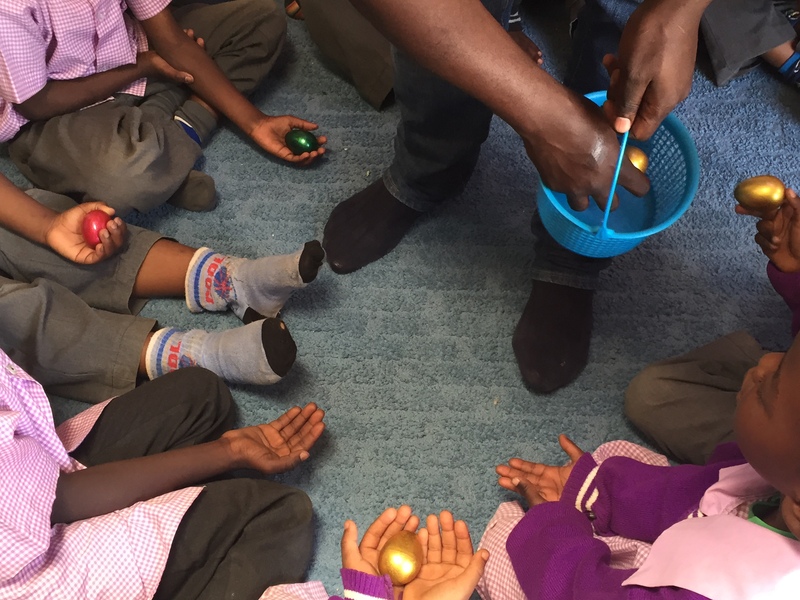 There are currently 7 ‘Super Starter’ classes in our room at St John’s school in the Korogocho slum. Each class has 10 students, 8-11 years old. 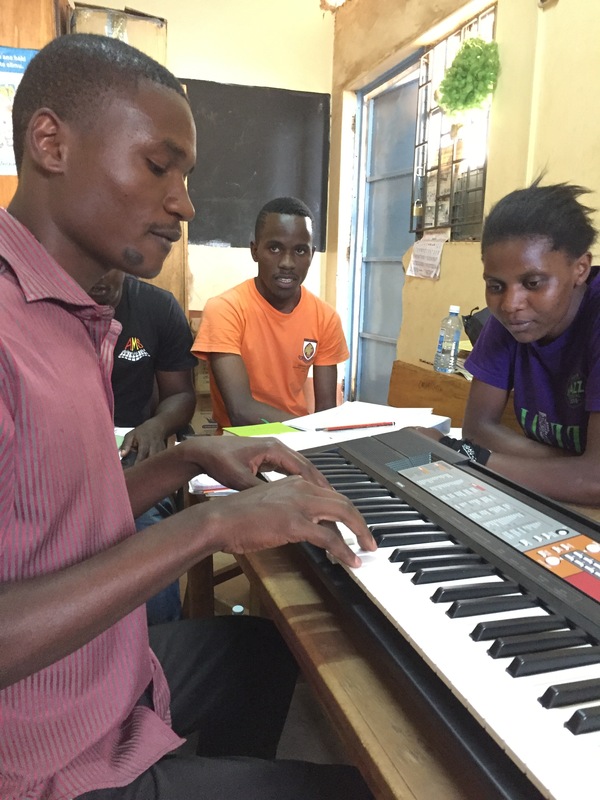 The classes are one hour each and as I write, they are learning to play ‘Toffee Apple’ and ‘Dreaming’. Their note and rhythm reading is going well. They are keen and making great progress. We are pretty excited. 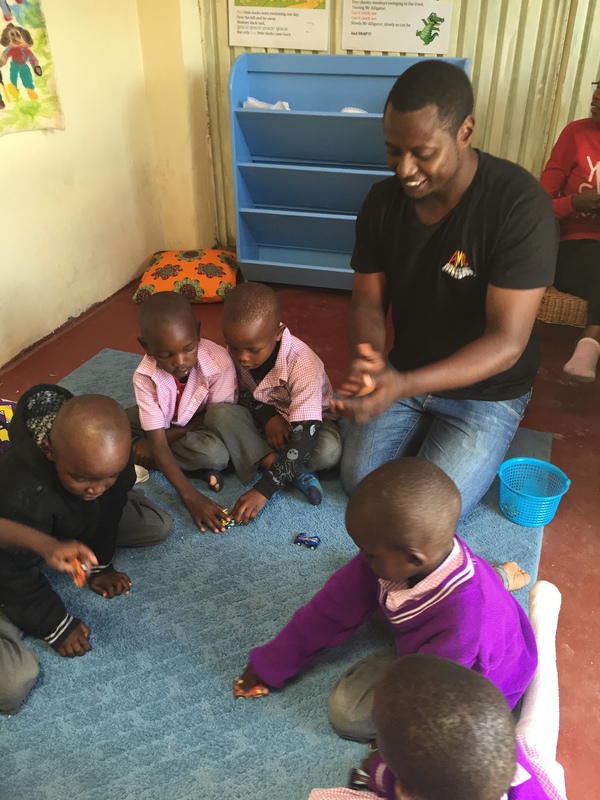 We also have 7 preschool classes doing our ‘Mini Musos’ course at the Angel Kindergarten in the Kibera slum. These classes are 40 minutes, catering to 3-6 year olds and we have recently introduced rhythm reading and imitation solfege into the program. The kids are gorgeous and have so much potential. All of this means that our teachers are gainfully employed! 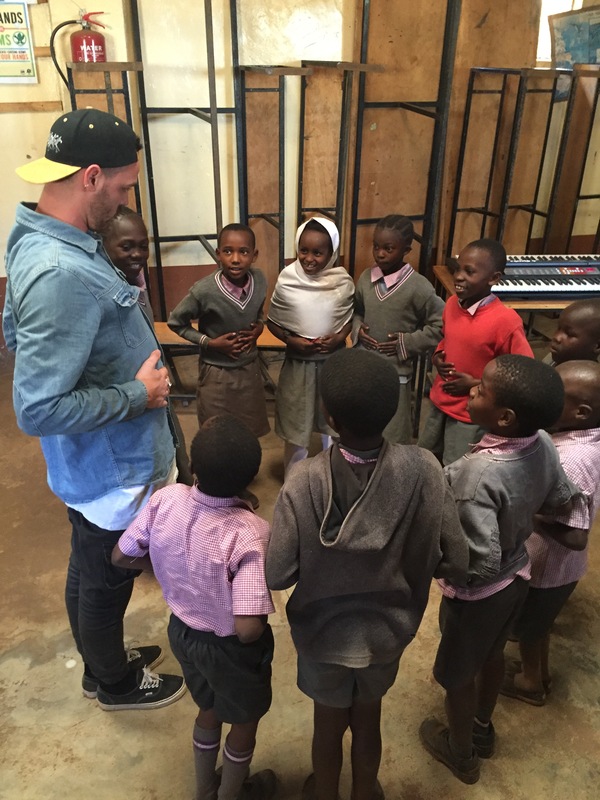 They each teach 4 or 5 classes a week, the income from which is changing their lives. 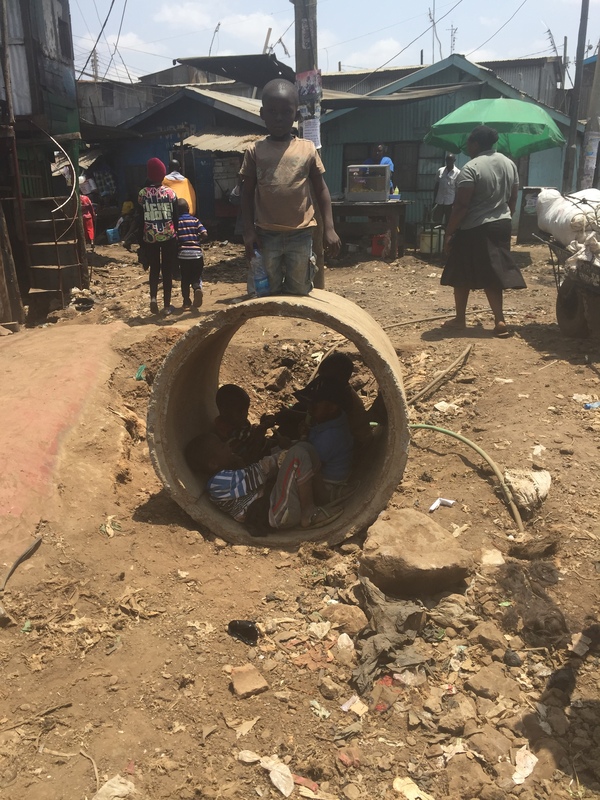 3 of them are still living in the slum but are now able to plan for the future. 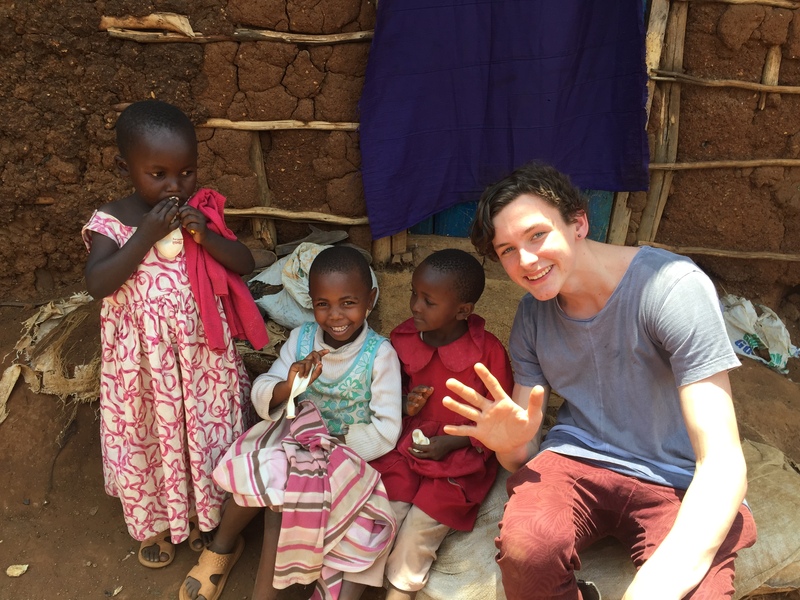 Simon, who is now 26, recently moved from the slum into a (basic in the extreme) apartment outside the Korogocho area. He is beyond proud. Jake visited and stayed the night which was quite an experience. A big big thankyou to all our families who donated boots & socks. It is hard to describe the difference this has made to the morale of the kids and teachers at St Johns. 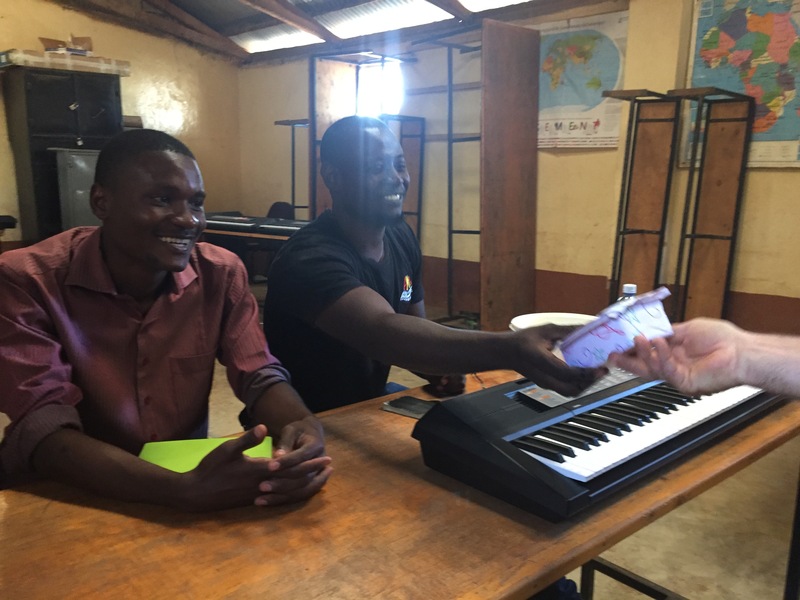 Also thankyou all for your concert donations which helped us buy the instruments for our new classroom! 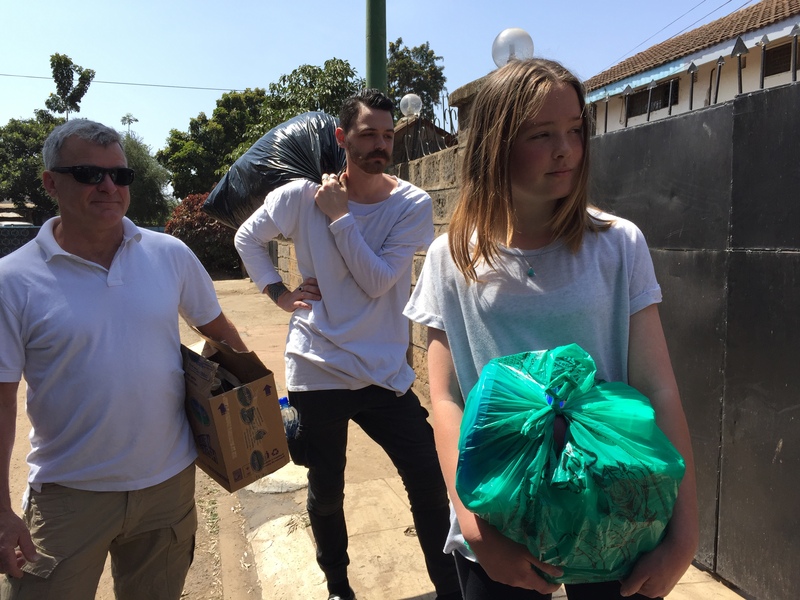 In reply to all those who asked ‘How was it?’ – our time in Nairobi was hard, wonderful, awful, tiring, beautiful, heart warming, encouraging and heart breaking all at the same time. Watch this space – we’ve still got lots to do. Monday October 5 – lift off! Finally! 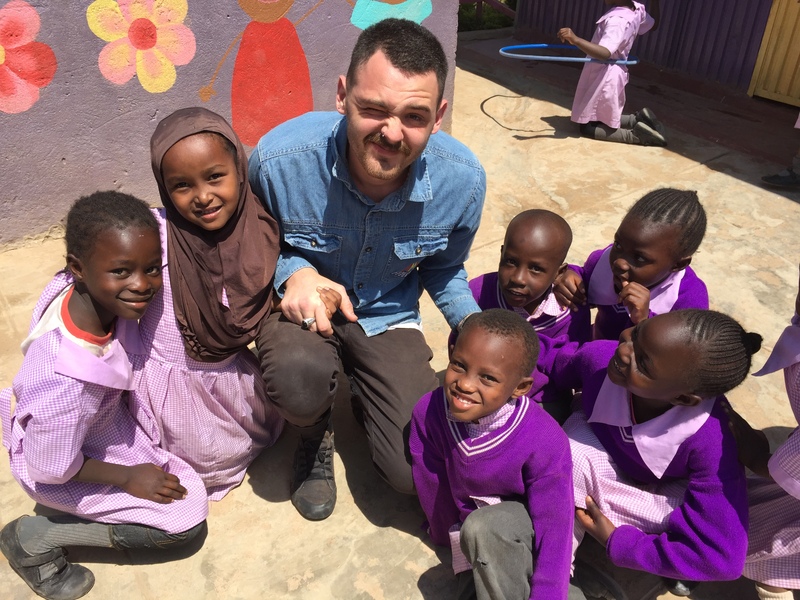 – Back to Korogocho slum to set up our new classroom, teach class and train our teachers. 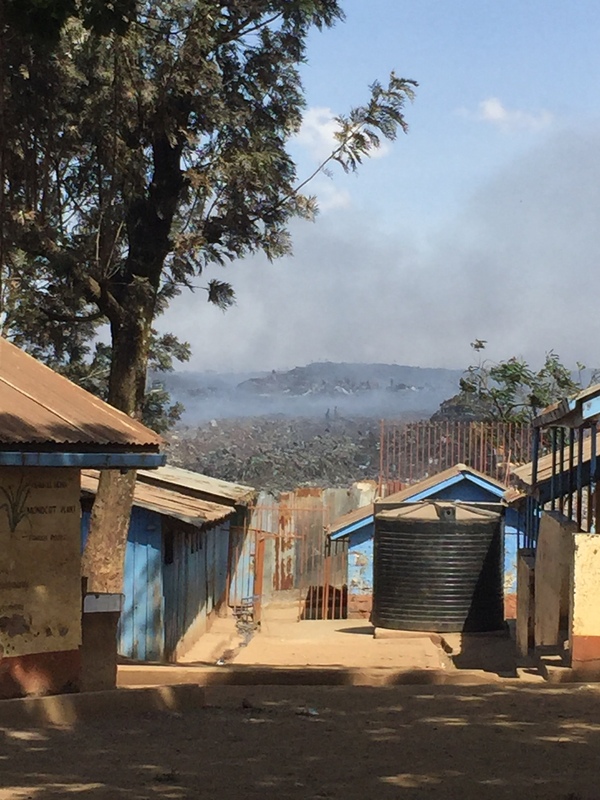 Eventually made it to St Johns School, Korogocho (remember, the one that backs onto the enormous dump site). 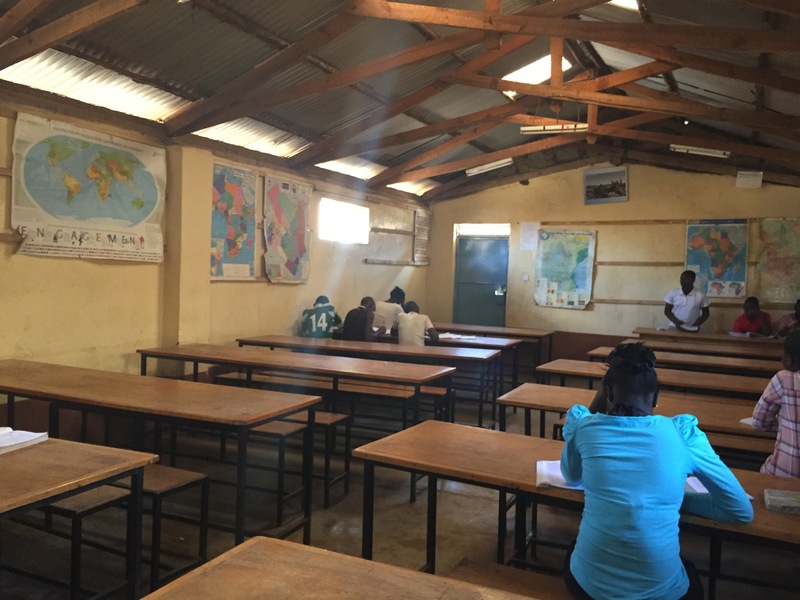 Because this is Kenya, our classroom wasn’t quite ready yet so we had a make-shift room for the day. Onward and upward! We moved all our brand new keyboards in boxes to the other building, shuffled things around, plugged everything in. 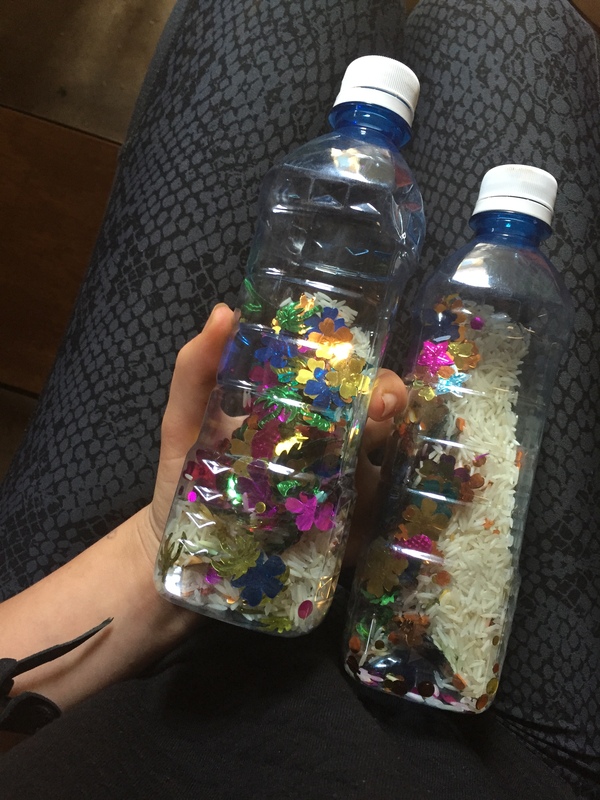 Tilly created shakers out of bottles with glitter and rice, Bill organized for timber to be cut into the right size for tapping sticks. 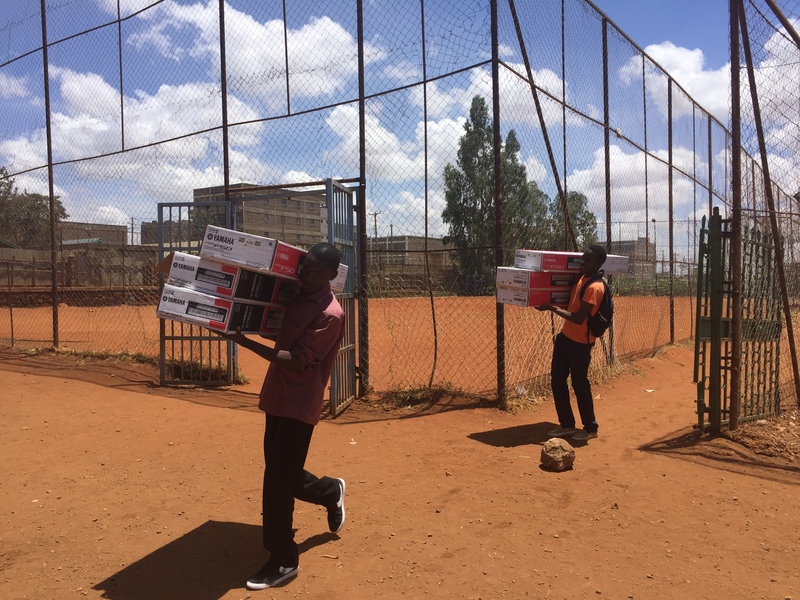 We grabbed a couple of minutes before the kids came in to give our teachers the phones that we’d bought for them locally yesterday. This is an important step as it is our only means of communication with them once we return home. They don’t have computers and they do have phones but they are Jurassic and we can’t even hear them when we call them, much less send them anything. With a phone we can send videos and photos of classes, share lesson ideas, monitor what is going on in class. Phones are ‘expensive’ but data plans are cheap so its manageable. All I can say is this watching them open the boxes was pretty special and I’ve not experienced excitement from adults quite like that before. Simon said ‘this is a dream!’ over and over…. 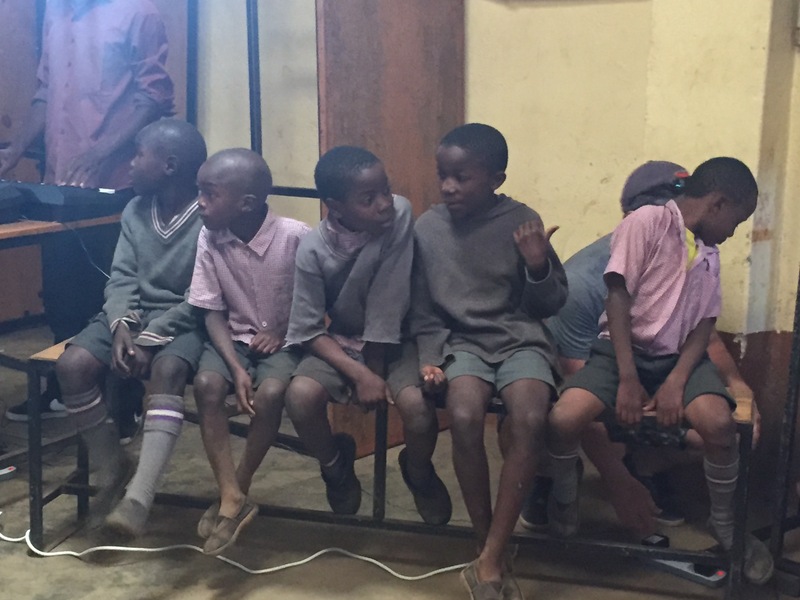 Then we held our breath as the first ever 10 kids came in for the first ever SUPER STARTER class on African soil. It was pretty exciting. Jake took the first class, I took the second class. The kids were beautiful, keen, well behaved. 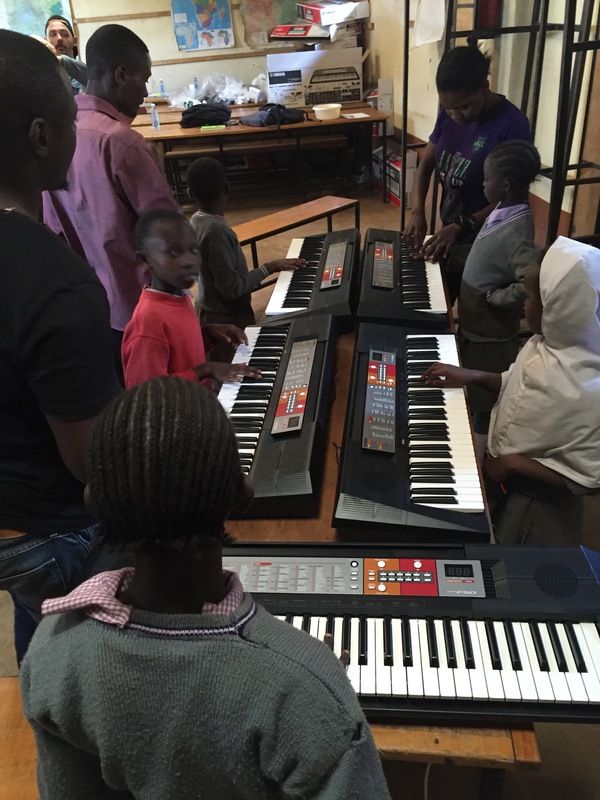 Most of the kids have never seen a keyboard before and jumped & smiled when they heard the sound! We made excellent progress in just one little lesson and we can see how great this is going to be. 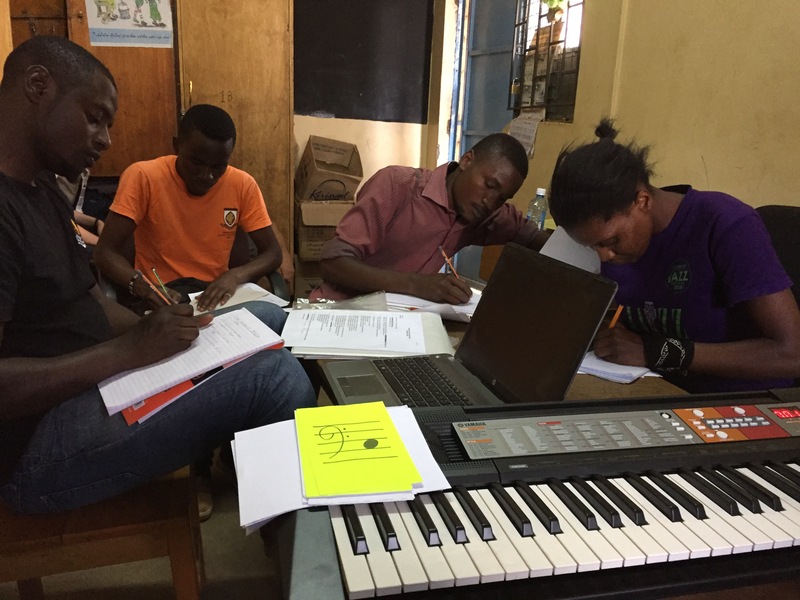 We did a couple of hours training with our teachers (we have a new one sitting in as well – Eric!) in a little room that is usually the Sport office. Covered quite a lot. 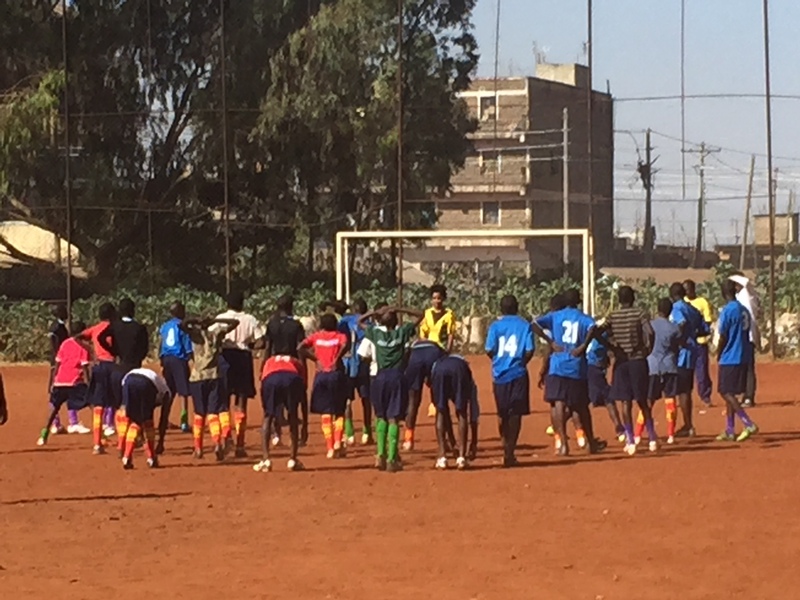 Moved everything back to the other building, got mobbed by the kids, watched a bit of soccer practice (sooo proud of their new boots and purple socks!) measured up for the final touches in ‘our’ room (need to get the rug tomorrow!) and eventually head off with 8 of us in our 7 seater. By this stage it was about 5.30. We hadn’t stopped for lunch and we were all ready to eat. Took everyone to the nearest Mall and had an early dinner together. It was great fun even if most of it was spent setting up ‘whatsapp’ for everyone and toying with their new phones. 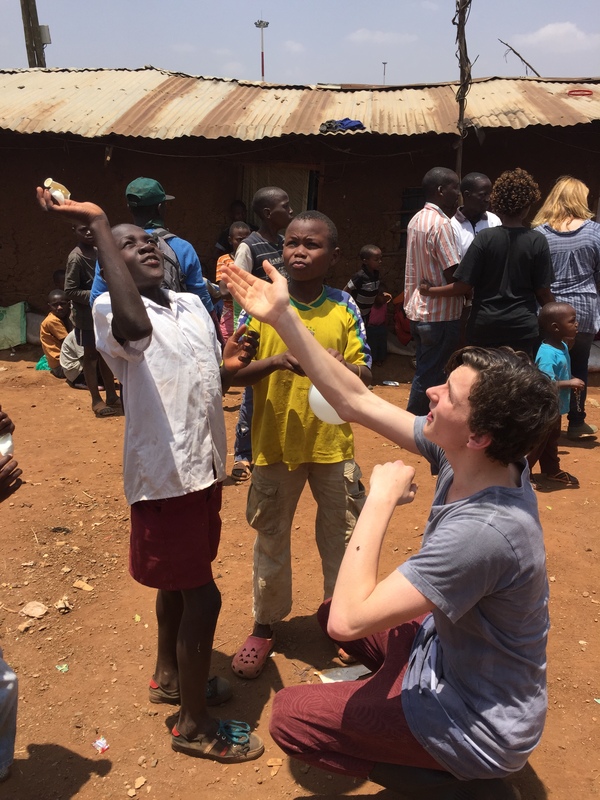 Tonight Jake has gone to ‘jam’ and stay the night with Simon (um, somewhere in Korogocho) and we took forever to get home in the Nairobi traffic. Have I mentioned how nuts it is here?! Well it’s not every day you almost get arrested…. 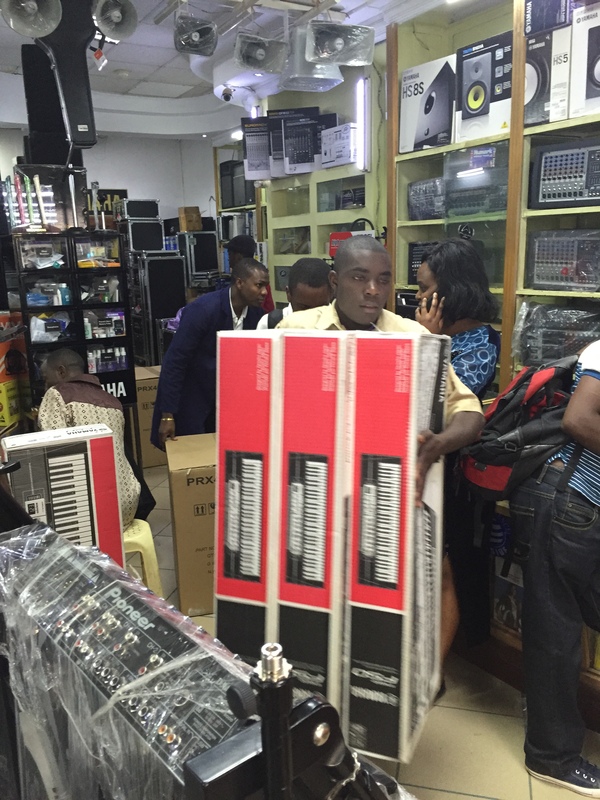 We were collectively on a mission to find the best deal on 12 good quality keyboards for our new classroom at Korogocho. Our AMS families have generously donated funds for this bit of our venture and we wanted to spend the money as wisely as possible. Sounds simple enough right? 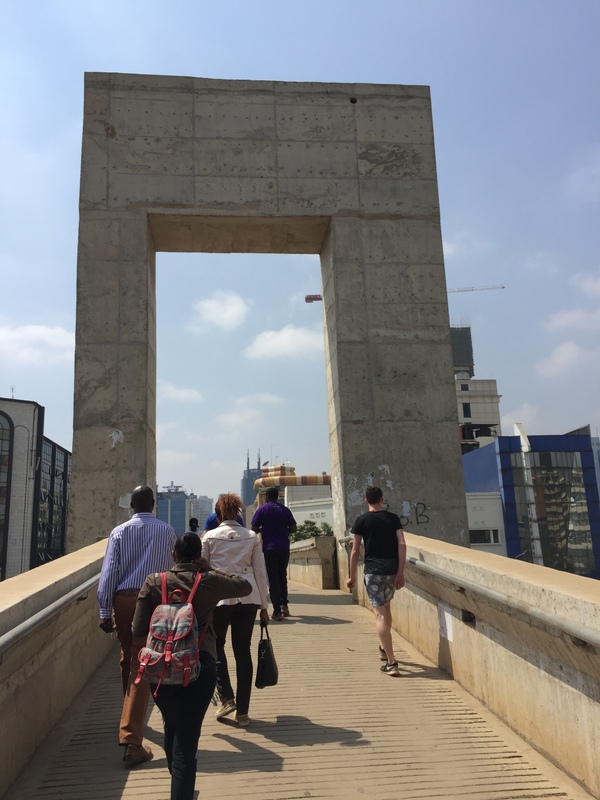 This was our first trip to down-town Nairobi City. We have driven through before but not stopped. It’s a no-go-zone generally for us because the police will pull ‘mzungu’ (whities!) up for anything and everything. Oh the corruption…. 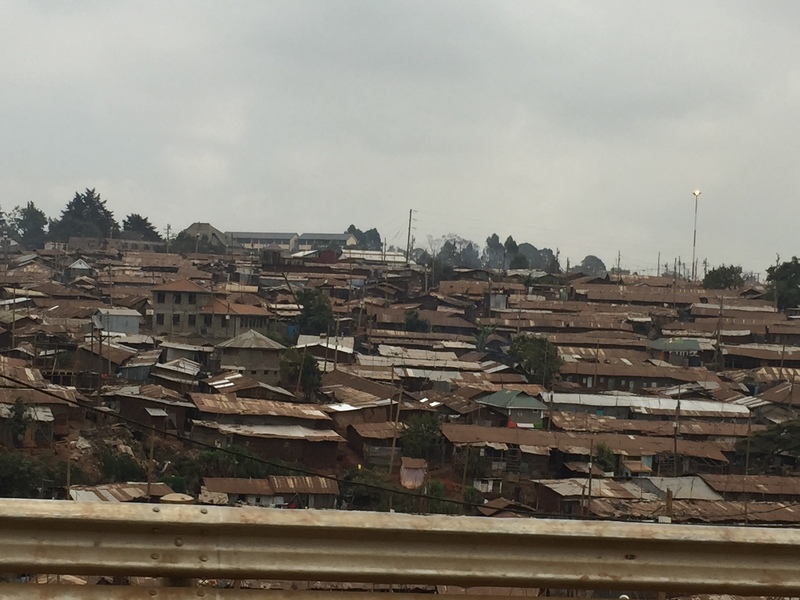 We met them without any trouble (incredible views of Kibera slum along the expressway!) and set off on foot to 3 different music stores. Walking through the true centre of town was a bit like walking in NYC (as Zac pointed out) – people and cars everywhere and you just need to be confident and go for it! We were with locals and Simon really is huge so we felt totally safe. So we sent Zac and Simon back to the store while Bill, Tilly, Clare & I collected the car, thinking that would save some time to pick up the keyboards. Silly us!! Not only did we get stuck in a jam for about half an hour but as we approached the store we followed everyone though the red light (all traffic lights are completely ignored here – chaos rules) and got pulled over by the ‘council traffic police’ for running a red light. Bill spoke a little about how we were actually following everyone else through the intersection, how we have been told to go with the flow of traffic, how we have driven here for a week without incident etc – but to no avail. I asked her to give us a chance, explaining that we are here to help and we have done our best to be good visitors and obey their rules. She said ‘OK I am giving you a chance. I will not charge the driver. You must only pay the fine for the car’. Clare took the opportunity to call Elizabeth from the back seat and basically gave her a loud serve about how unfair everything was and how we were doing good work here and trying to help and how the officials were doing the wrong thing. This was half English, half Swahili but I got the gist of it! Next thing, the female officer tapped me on the arm and said ‘Ma’am I am going to give you the chance that you asked for.’ When I asked what she meant she said ‘I will let you go’. I clarified that this meant no fine, they would get out of our car and leave us alone. She nodded each time. Bill was suddenly all appreciative and thankful and patting her arm and kissing her hand – which apparently is exactly is what is required. ‘Thank you so much! We really appreciate your kindness. We would like to buy you lunch!’ And asked me to give her a thousand shilling note (about $14). They got out of the car and that was that. 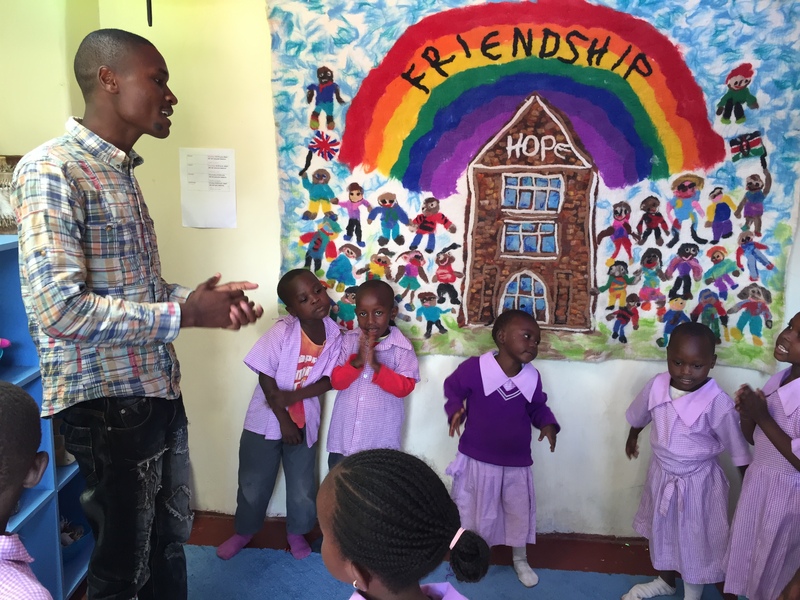 Of course, our Kenyan friends were apologetic and mortified – but it’s also just how things are here. Finally back to the store to meet Zac and Simon. The next 2 hours or so were spent waiting for a parking spot for the delivery van to get our keyboards from the store house into the store, waiting as Bill drove round the block at least 6 times looking for a parking spot (Simon went with him as Clare was sure he would get arrested again! ), trips to various ATMs to get the required cash as they reckon the credit card would take 45 days to clear (yeah right! ), watching as they mis-counted our money and came up short twice before admitting it was all there and generally trying not to go nuts! While we waited, Clare and I helped the staff check every one of our 12 Keyboards and every power adaptor. I wasn’t too concerned about this but Simon was pretty certain it was a good idea. It was all a bit of a circus. The whole process only took about 7 hours! 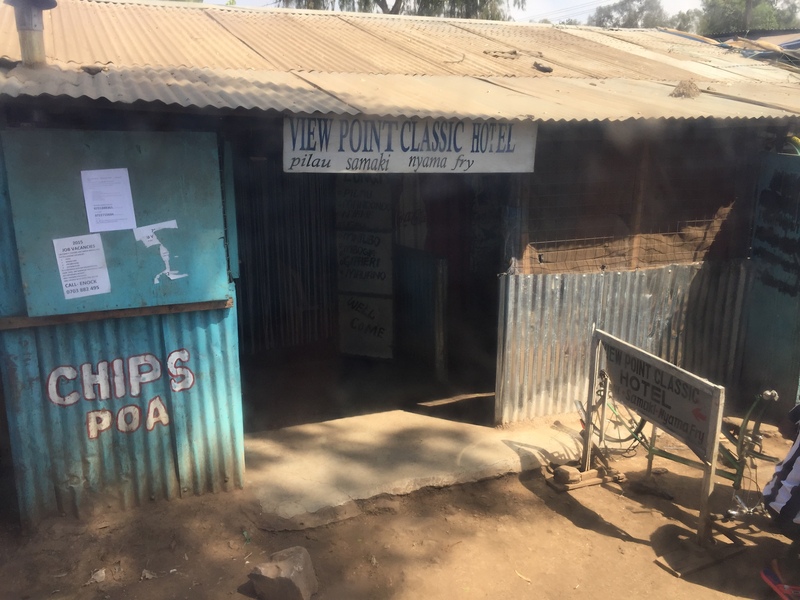 We were hungry and ‘had it’ as we made our way back through the city to our home in Karen. 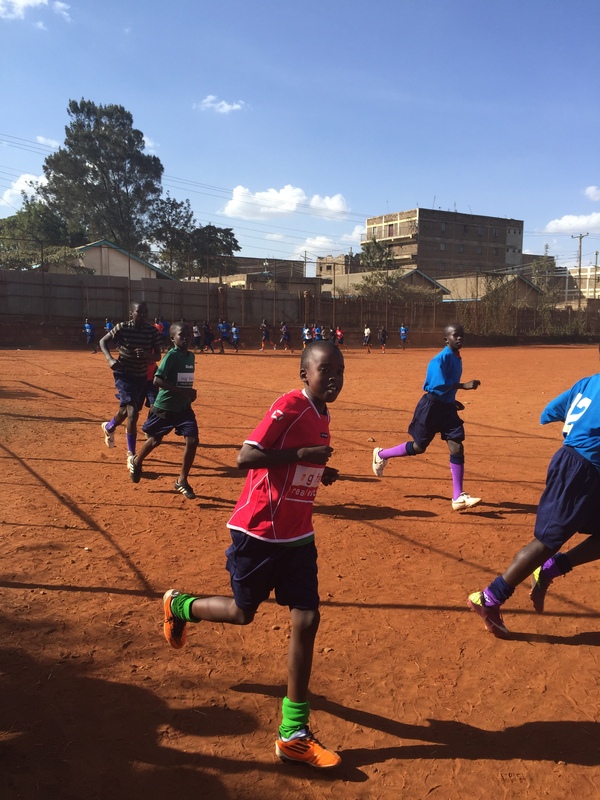 Tuesday September 29 – Soccer Boot Day! Well we didn’t get lost on our way to Kibera this morning but we did get pulled over by the local police who decided we needed our passports in order to pass through his checkpoint. This is, of course, utter rubbish and an attempt at bribery. Bill showed his Aus drivers license but the cop was insistent that we go home and come back with our passports in order to get though. Right. Well we backtracked and took the long way which meant we were a little late but no big deal. But OH the corruption! 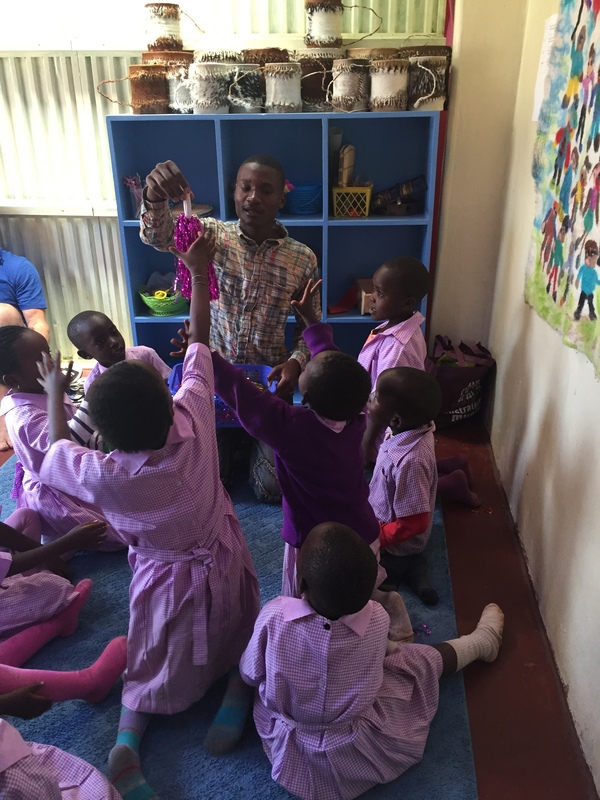 Once safely at Angel we loved seeing the kids again and had a very successful morning of training with our teachers. They are awesome. It’s lovely to learn a little more about them. 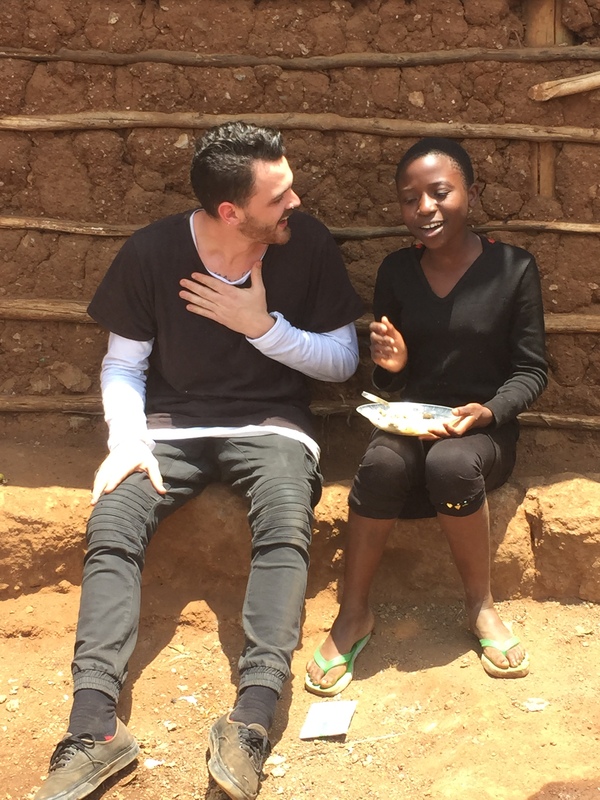 Today we found out that having this job has meant that Celine has been able to rent a small plot of land for her mother who is farming it in order to produce an income for the family. She borrowed the initial amount from Elizabeth (more on her in a minute) and having taught now since April, paid it back today! How wonderful. 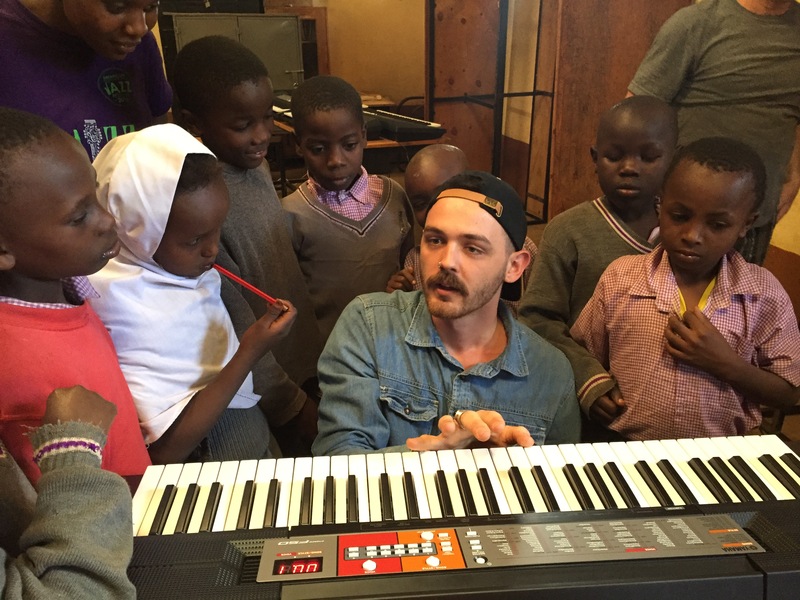 Simon has been a street kid, a gangster, a farmer, a student and a musician! He is now a lovely teacher and a huge asset to us. After lunch we squeezed everyone into our 7 seater hire car (5 of us, 3 teachers) and set off for their home turf, Korogocho. 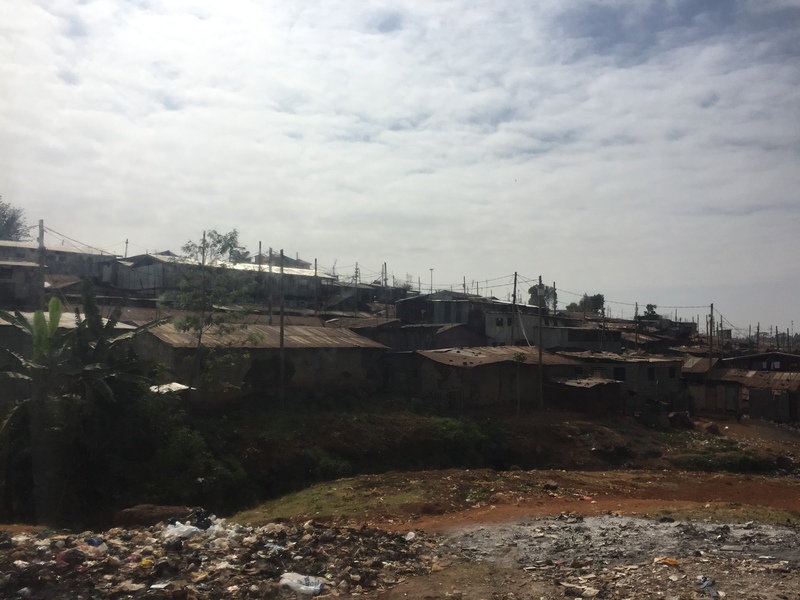 Korogocho is another of the slums in Nairobi. 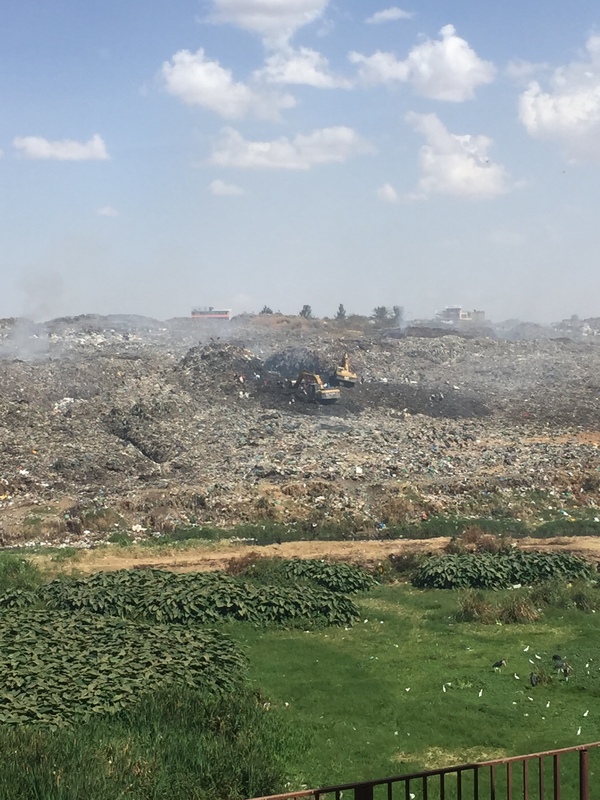 It’s not as vast as Kibera, housing 150 thousand people in 1.5 square kms but apparently more dangerous with gangs and the like. The thing that really sets Korogocho apart is that it backs onto the most enormous tip with vultures sailing above it. It goes on forever. 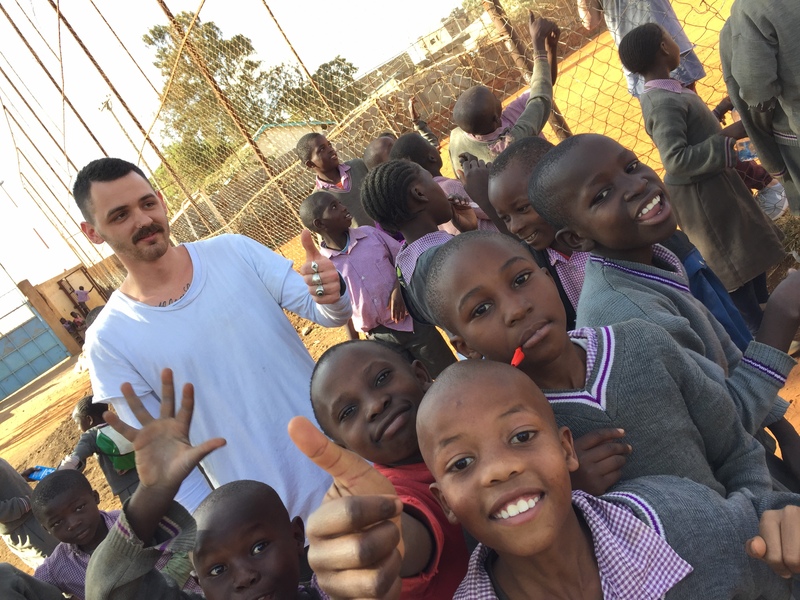 Anyway we battled the stupid stupid traffic and made it safely into the compound that is shared by St Johns school – 750 kids in a tiny dusty school – and Ghetto Classics. 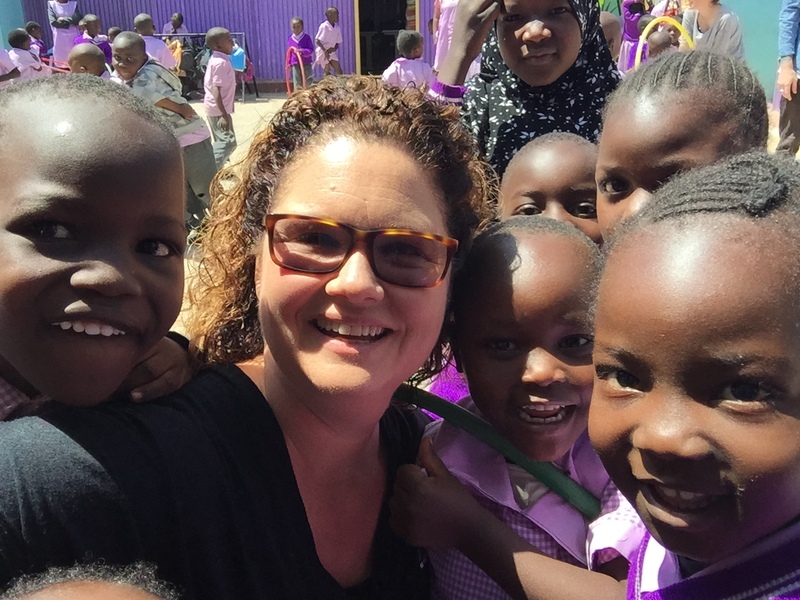 Here is where Elizabeth comes in – she is a fabulous Kenyan woman who has lived abroad for many years. 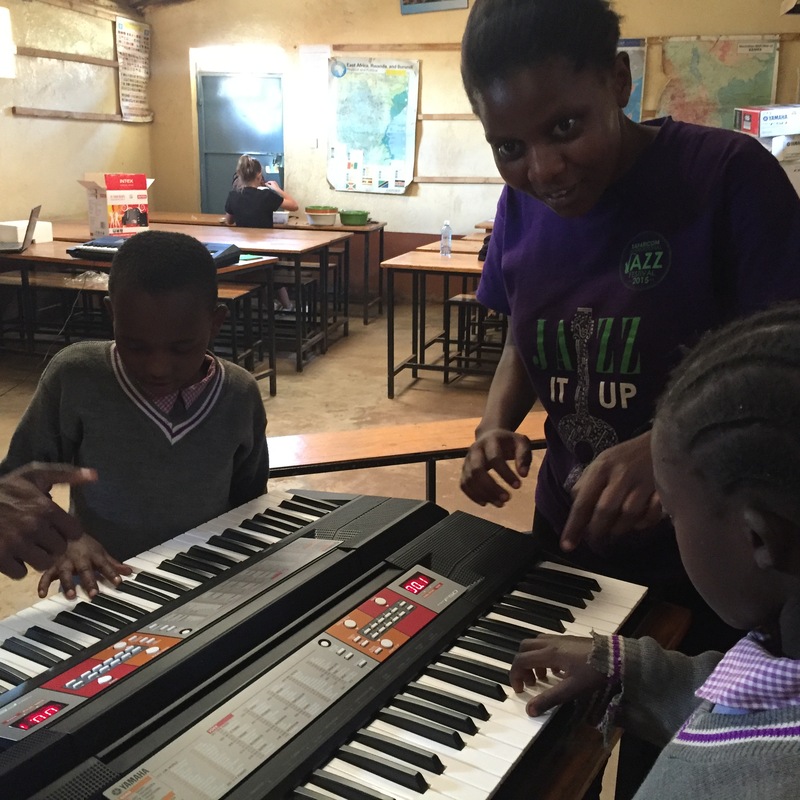 She is classically trained (music) and came back to live in Nairobi to set up an amazing instrumental program in Korogocho. 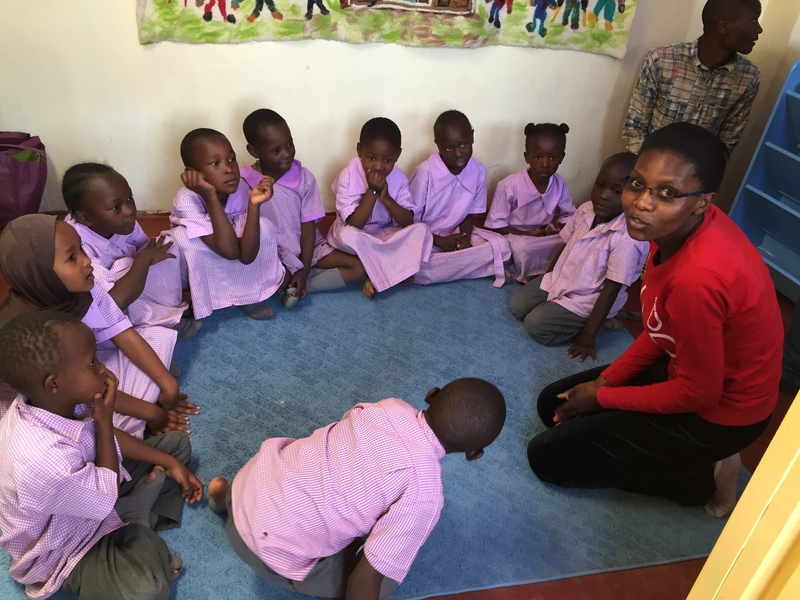 She originally sourced our wonderful teachers, who had come through her program. 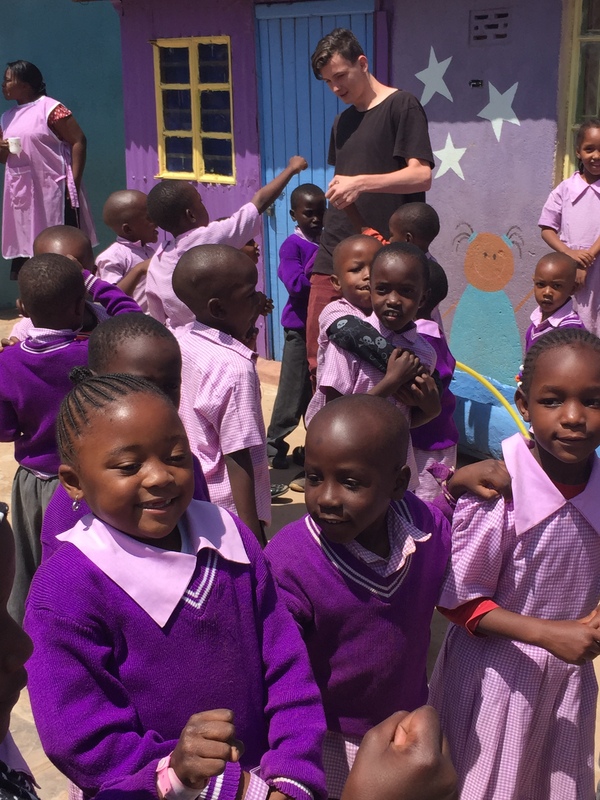 We met the principal of St John’s who explained to us his vision for the school – to be self sufficient rather than relying on help from outside Kenya. He was enthusiastic and eloquent. 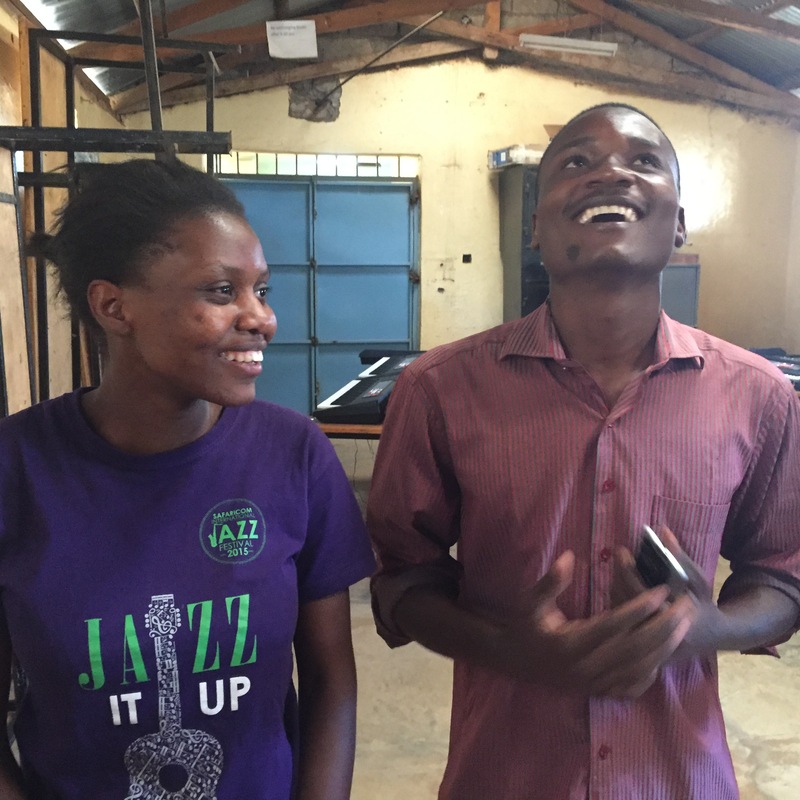 He spoke about the roof leaking (Um, really badly) and their plans to raise funds for a new one from within the school and Korogocho community. We had a tour of the library and study area which is open to the public and open to students until 8pm each day. The books do not leave the building but everyone is welcome to come and use them on site. They were so proud of this! We also met the head coach. He and the principal were both beside themselves at the donation of soccer boots / socks / shirts that we took with us today – all donated by AMS families! They showed us the little box of current boots which, to be honest, looked like they belonged on the tip. They were so excited, we were excited – it was great. 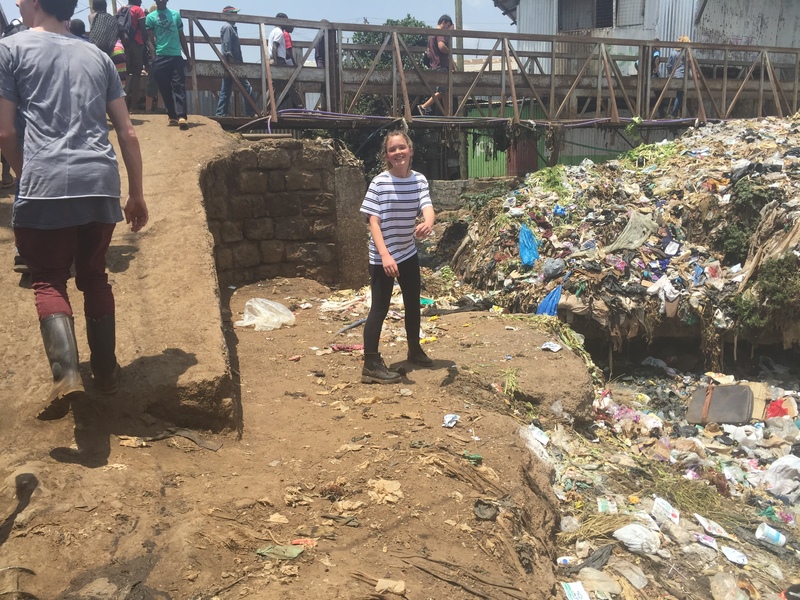 Over to the Ghetto Classics rooms (just across the very red, very dusty football field) to discuss with Elizabeth where we are up to in our efforts to establish an ‘AMS classroom’ within the compound. While we did that with Jake, Tilly slept on a wooden bench (she wants to know if we think she has chronic fatigue! 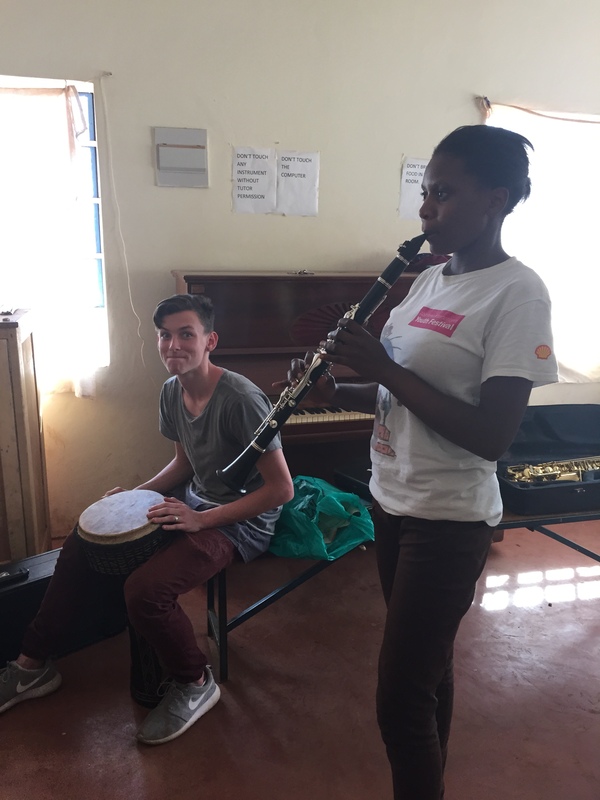 Don’t panic, we’re just doing big days and burning her out a bit) and Zac played African drums to accompany some of the other teens as they rehearsed various bits and pieces – which all sounded really good. 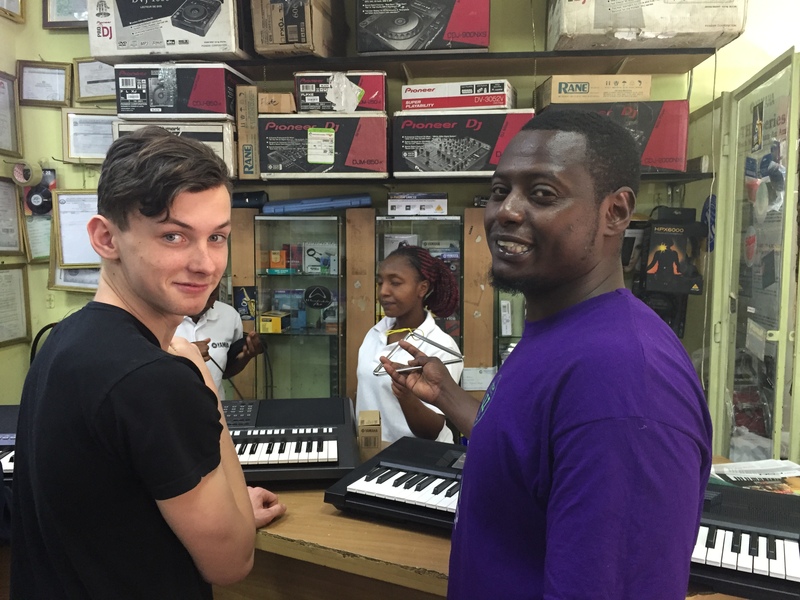 It was a great meeting and tomorrow we go out with Elizabeth’s driver and her PA and our teacher Simon to buy the keyboards, electronics and carpet to make it happen!! Can you believe it? We almost cannot. Really! This is what we are here for. 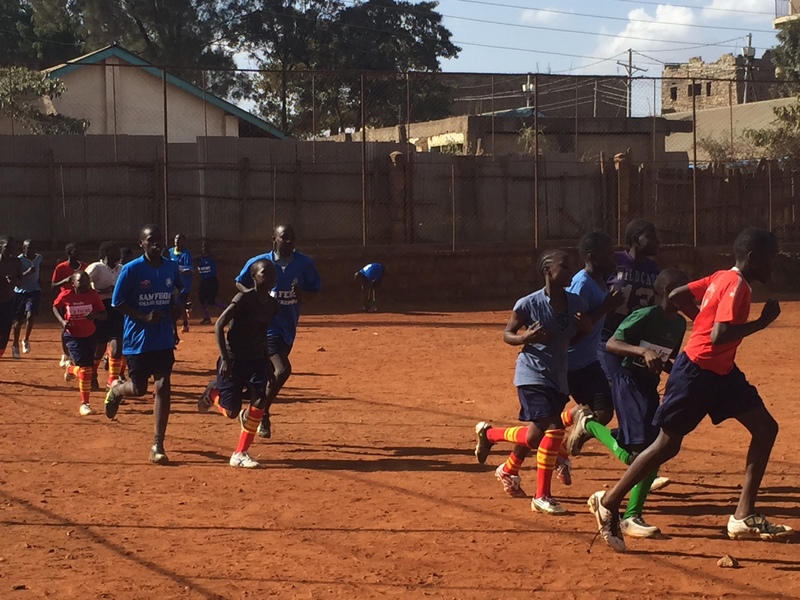 Went back out to see the school soccer team running on the field in their new outfits! What a moment. Said our farewells & took a few photos before the looooong drive back. It’s good to know we will be back soon. The. Traffic. Is. Ridiculous. Argh. Off to the Angel Kindergarten this morning. 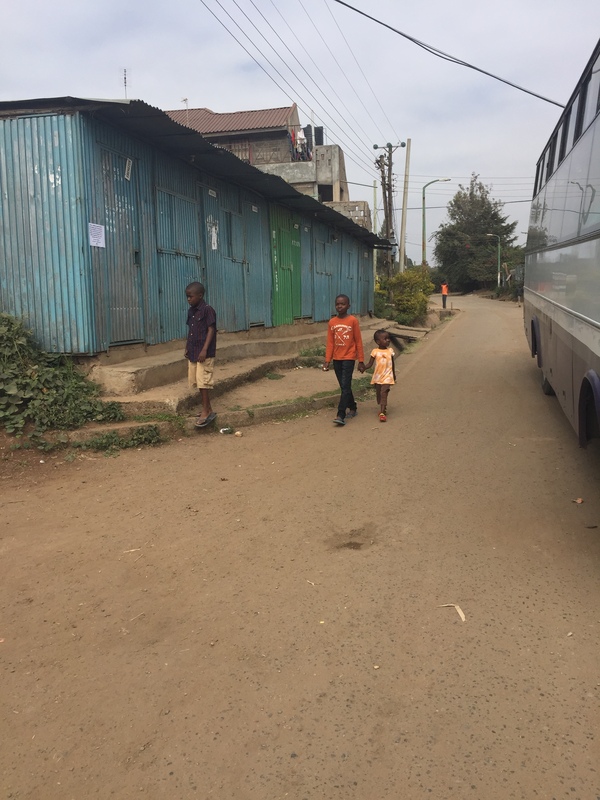 We only got a teeny bit lost getting to the preschool (getting lost on Kibera Drive is a very scary thing). Bill is very calm on these nutty roads and our kids LOVE it! (I was scared but I tried to be scared quietly). Finally got Sally on the phone and got extra directions and made it into the compound. 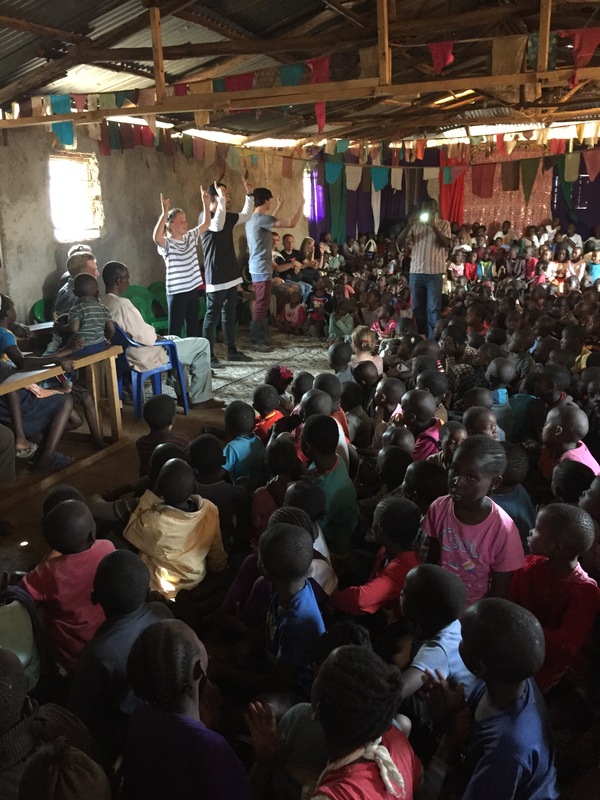 We were there to watch our tutors teach their classes and work out where we are at and what happens next. I’m thrilled to report that they were AMAZING!! The kids know everything really well and the teachers know exactly what they are doing and are doing it brilliantly. They are more than ready for the next unit of work so Jake and I started on it right away. We did a couple of hours and got through lots of material. I’m inspired!!! We recently lost our 4th tutor as he was involved in an inappropriate relationship with an underage girl. He had been warned as this has happened before. It’s heartbreaking. Thankfully we knew this before we came here but it’s still awful and we miss him. He was very talented. 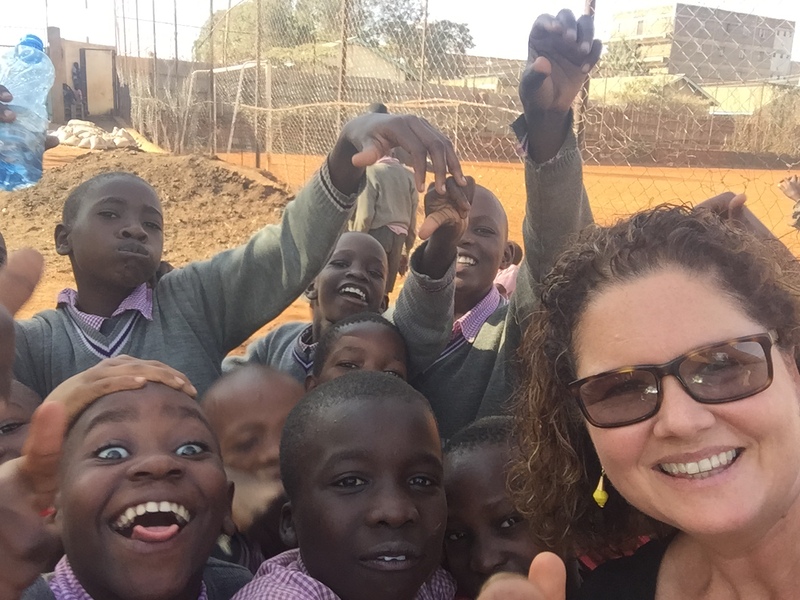 However, Sally has found an amazing lady who leads the 400+ kids in singing at there Lunchbowl program in Kibera. Her name is Faith and today she came to join us for some training. She is going to be wonderful!!! While all this was going on for Jake & I, Zac was in the main classroom helping with an English class and Tilly was in the playground continually entertaining heaps of kids. I’m so proud of all of them. After a couple of hours Tilly crashed out on the concrete floor under a table in our little music room (!!) 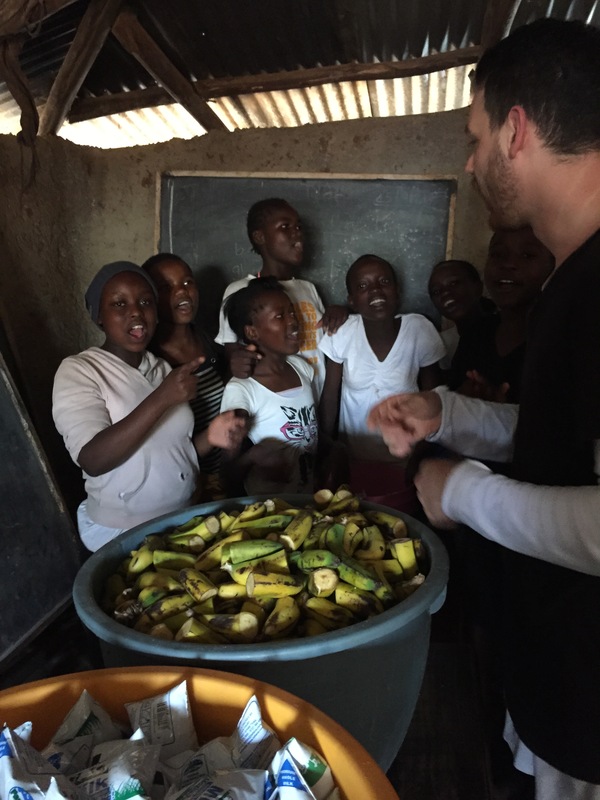 while Jake and I kept going ….we shared our lunch with our tutors who were happy to have our extra apples, bananas and muffins. When we finished, Simon told us how proud he was to be doing this job and how the money has changed his life. ‘I am now able to take care and provide for my mother. She is older now and cannot work – now I feel like a good son’. Honestly? It breaks your heart. 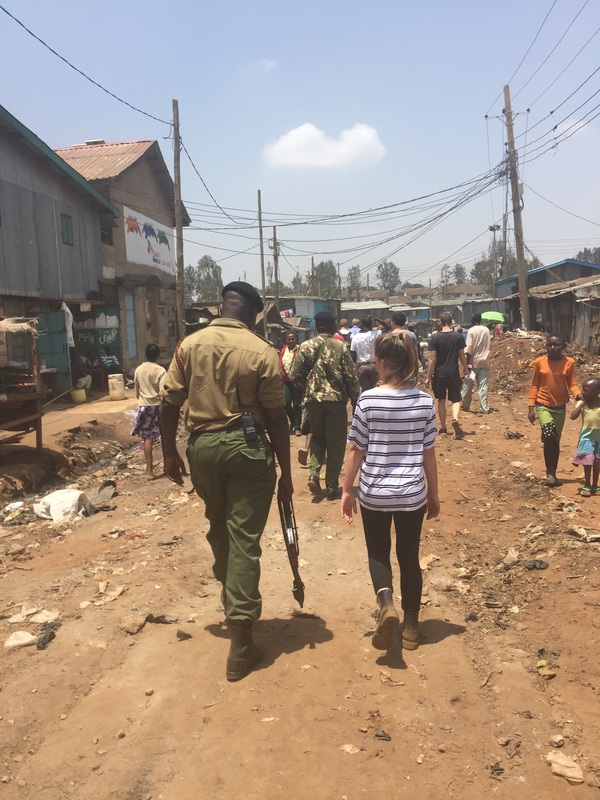 Today we met Sally (Angel Kindergarten / Lunchbowl network) and family at our local Nakumatt (supermarket) and followed them to meet our guards and park the cars to walk in to Kibera. Saturday is the day for the feeding program with the Lunchbowl Network. 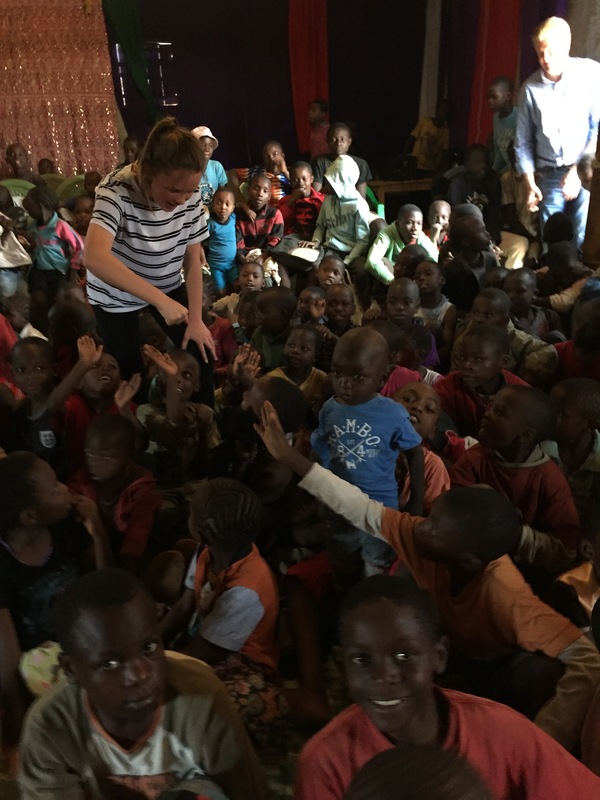 Bill and I were part of this in April with Miss Lindi and we couldn’t wait to take our kids in with us. 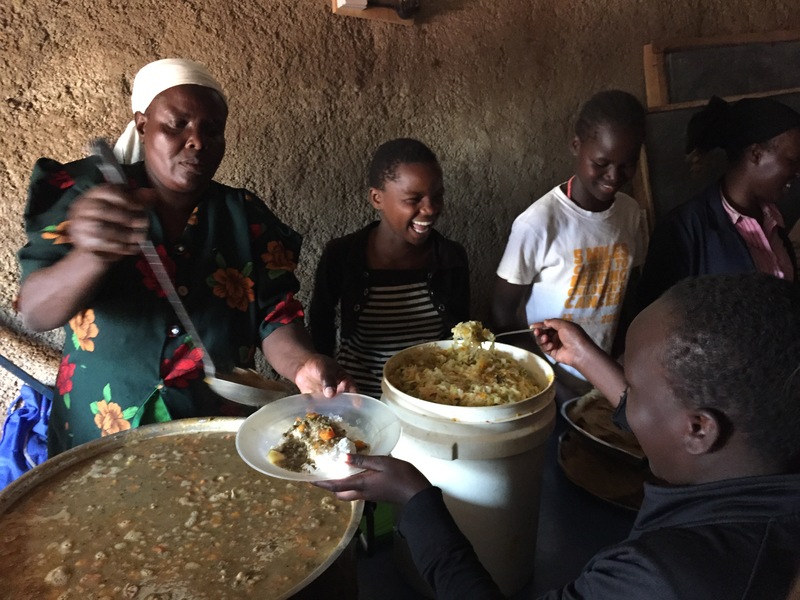 The Lunchbowl Network feeds over 400 children each Saturday. 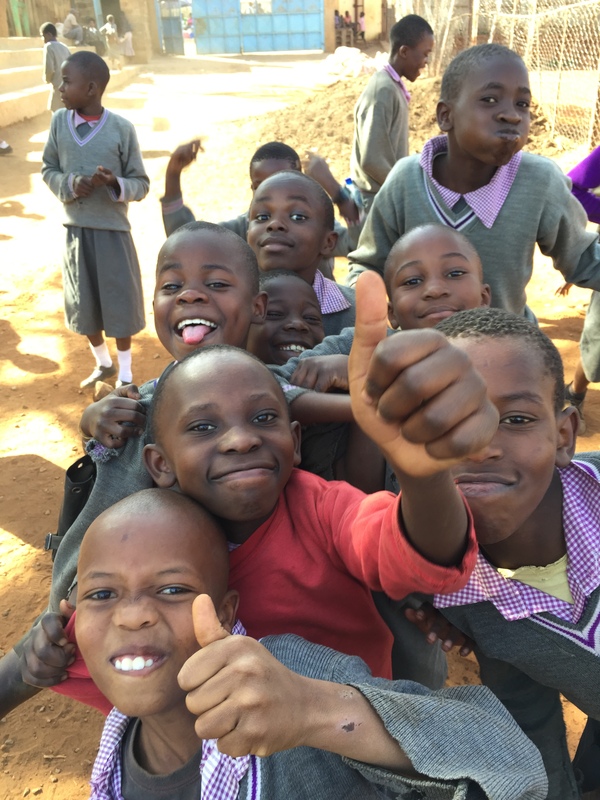 There is a screening process to ensure that the children who benefit are actually the poorest of the poor. 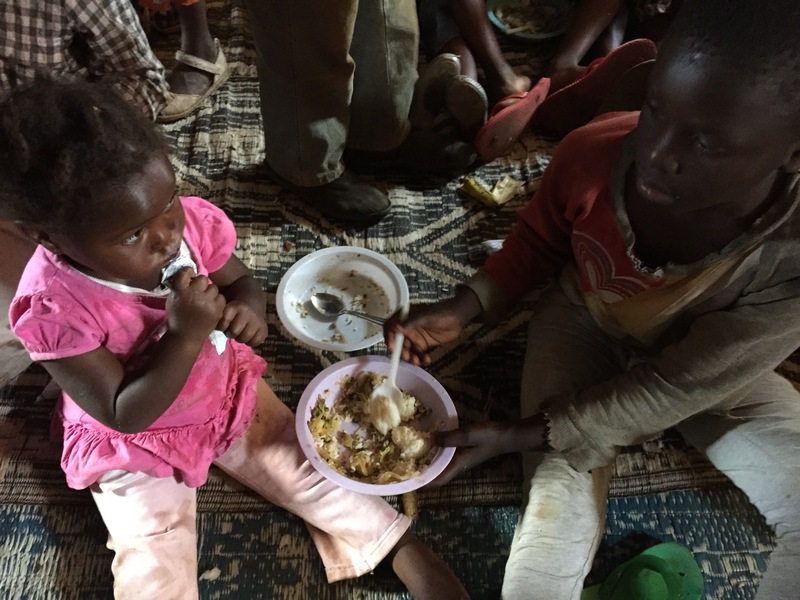 For these kids, this is their only decent meal each week. We met everyone without any fuss and Bill did a brilliant job of navigating the horrendous Nairobi traffic to get us close to Kibera. 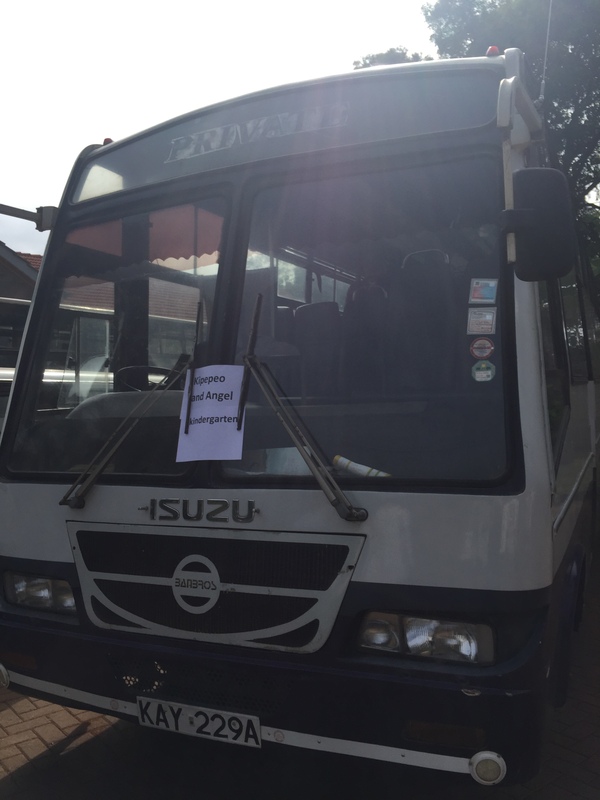 Between potholes, nutball drivers and the Matatu (hilarious little public buses) it’s a nightmare on the roads. The Matatu however have kept us duly amused. The drivers name their buses with signage all over the place. They have names like ‘Luminous’, ‘Compliant’, ‘Reliable’, ‘Selfie’ and our favorite of the day: ‘In God We Transit’. Bahaha. 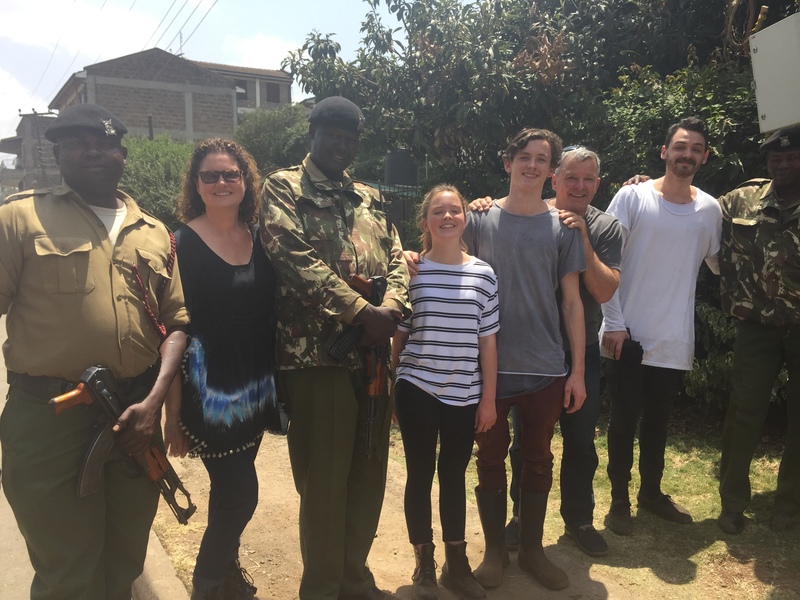 We met our armed guards – (two of whom were the same as last time – Patrick and George. So wonderful to see them again!) and our Kiberan natives for local credibility and off we went. The walk from the secure place where we parked the cars to the compound where lunch happens took about half an hour or so. As expected, the sights along the way were truly something to behold. My favourite photo of the day was Tilly & George having a casual chat as we walked through the streets. The way these people live is amazing. 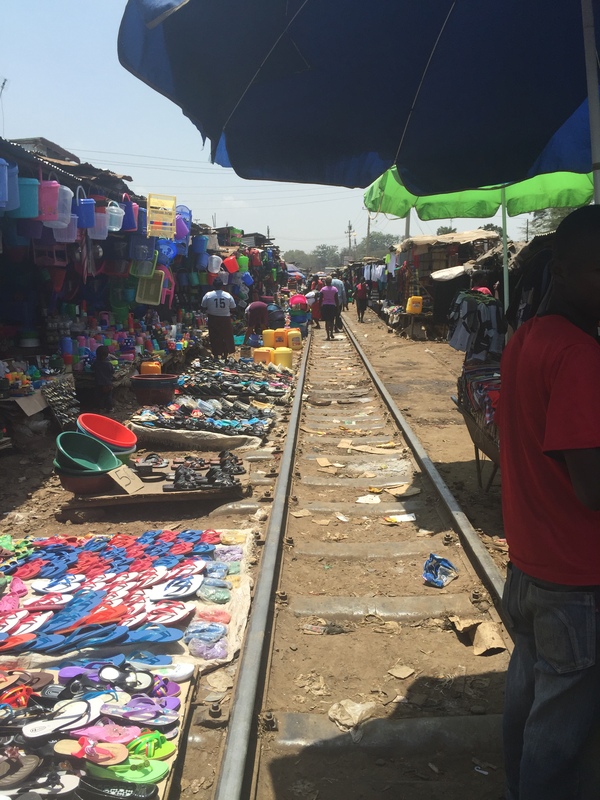 Photos are of ‘the Dubai of Kibera’ where you can buy pretty much everything, the train line that is so seldom used that the stall holders had to quickly move everything out of the way – and straight back into place again, the rubbish and sewerage that is the norm along the pathway and the people that don’t seem unhappy with their way of life and greet us wherever we go. 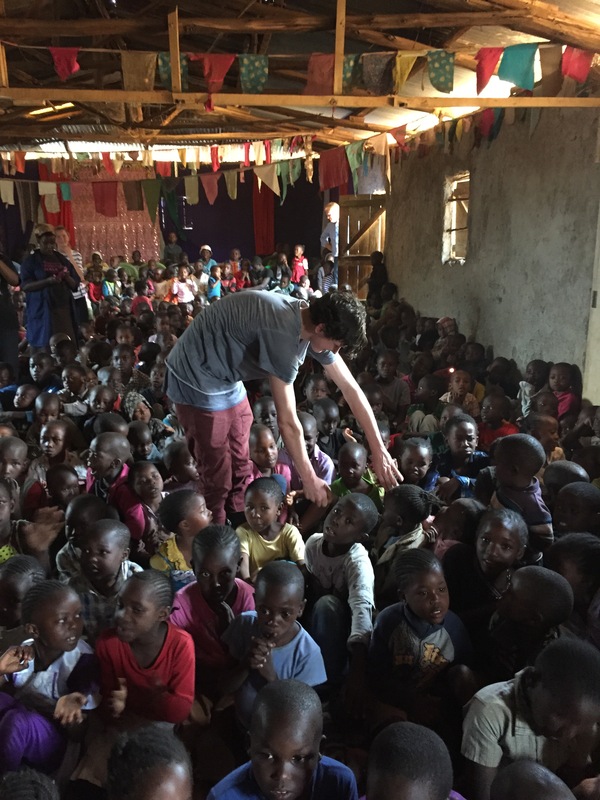 Once we arrived at the compound we sat and watched a few items from the older kids. 2 cute songs (think 70s church choruses) and a hip hop dance! Then it was our turn. Sally introduced us and Bill said hi to everyone, via a translator. 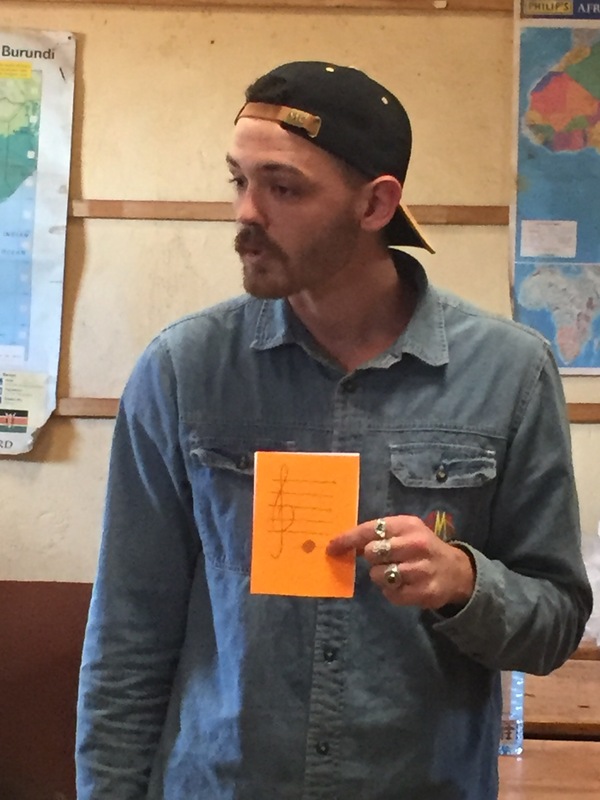 He talked about how many moons it had taken us to get to Nairobi, which was really cute. Jake Zac and Tilly sang 2 songs and 400+ kids joined in. Quite an experience. Then it was time to help feed the kids and the familiar and amazing human production line appeared. We helped pass plates along to the kids who waited their turn and helped each other until eventually, everyone had eaten. The process took a while – maybe 40 minutes or so – and the room was really muggy with all the bodies, the hot food, the excitement! Jake had a wonderful time serving food with a girl called Anna while Zac, Tilly & I tried not to step on little hands and feet as we moved through the crowd to pass out plates of food. It’s beyond description the way the older kids help the young ones & wait their turn. For kids that are clearly hungry there’s a tangible absence of push and shove. Once that was done the kids went outside and we got to play and chat with them for a while. Someone had a few balloons and Zac had a great time with a group of boys and girls. A little boy named Francis is very unwell – organs are within the skin but outside of his ribcage. I actually don’t want to describe it too much but Sally asked our family to gather to pray for him which was a very moving couple of minutes. He was then taken to the hospital. We are hoping to hear news of him in the next week or so. When it was time to say goodbye both Zac and Tilly asked me several times if we would be back. Tilly said she didn’t want to say ‘see you soon’ if it was a lie – she wanted to tell them that she would see them again. I had to be honest and say I don’t know. We walked back out, farewelled our guards and drove back through the crazy traffic. 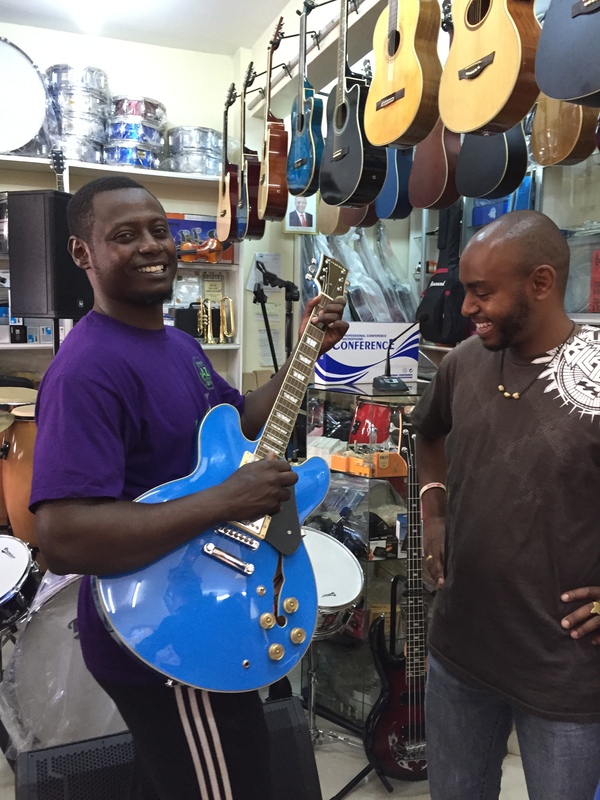 This time we had Barak with us – he grew up in west Africa but now lives in Nairobi. He was a wealth of local knowledge (and shortcuts!) on our way back home. Home for showers etc. Tilly and I took off our gumboots which were pristine when we left this morning and revolting when we returned. 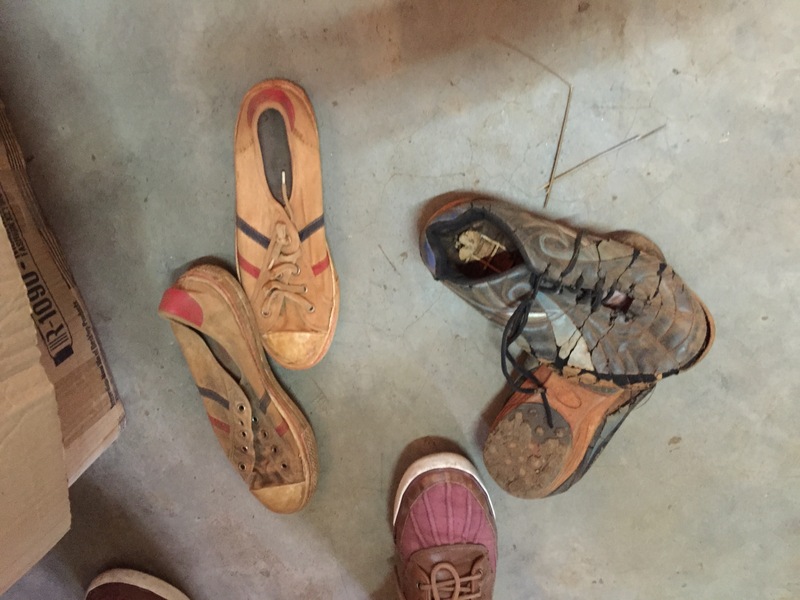 It wasn’t just the raw sewerage and the mud: Oh the red dust… everywhere. We were all up pretty jolly early but that was ok because I’d brought a little pile of work to do and the wifi in the house is excellent. Our house comes with Tabitha, the house lady, who is paid the equivalent of about $14 a day every Friday. She cleans, mops, does the laundry. We want to bring her home!! She’s gorgeous. Our kids are in love. So we got organized and tidied up a bit (so she could find the floor) and head off. 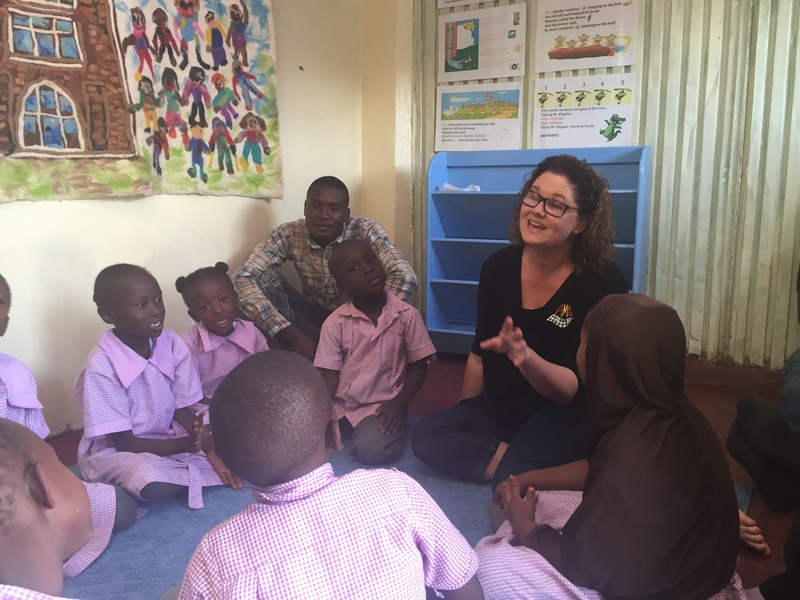 The West Nairobi School (where ex AMS teacher Cathy Sampson teaches classroom Music) were going on a ‘community service trip’ to the Angel Kindergarten (where our music classes are) and the Ki’pe’peo workshop (which Cathy is involved in) today. Excellent! They needed a couple of extra chaperones. Perfect!! So we boarded the school bus along with Cathy & a bunch of teenagers and off we went. It’s about 40 minutes to ‘Angel’ with LOTS of amazing things to see along the way. Lots of amazing sounds too – the kids on the bus sang in harmony most of the way! 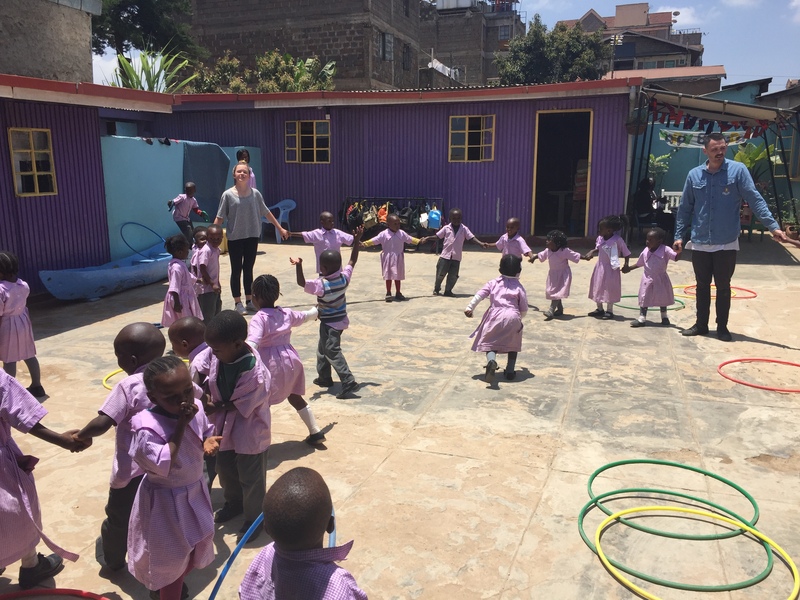 The kindergarten in on the fringe of the Kibera slum. 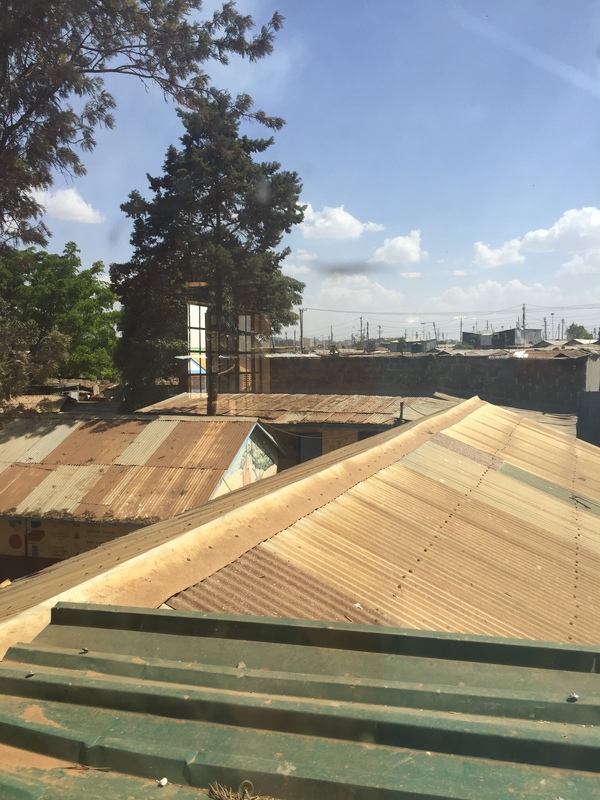 The bus took us along ‘Kibera Drive’ which cuts right through the middle. The shops and stalls are incredible through here. 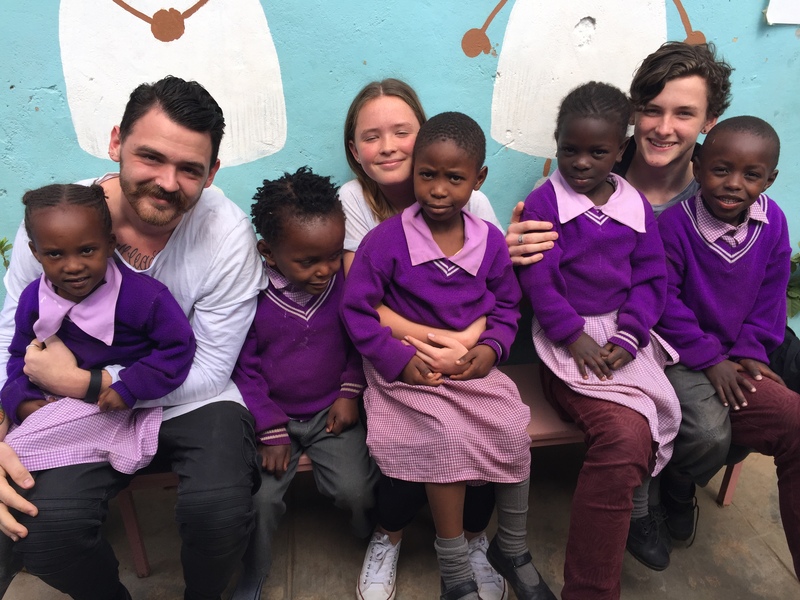 It was a quick stop at ‘Angel’ to settle in the students who were there to help out for the morning. But it was long enough to say hi to Sally who runs the kindergarten and our teacher Simon who was teaching an AMS class! 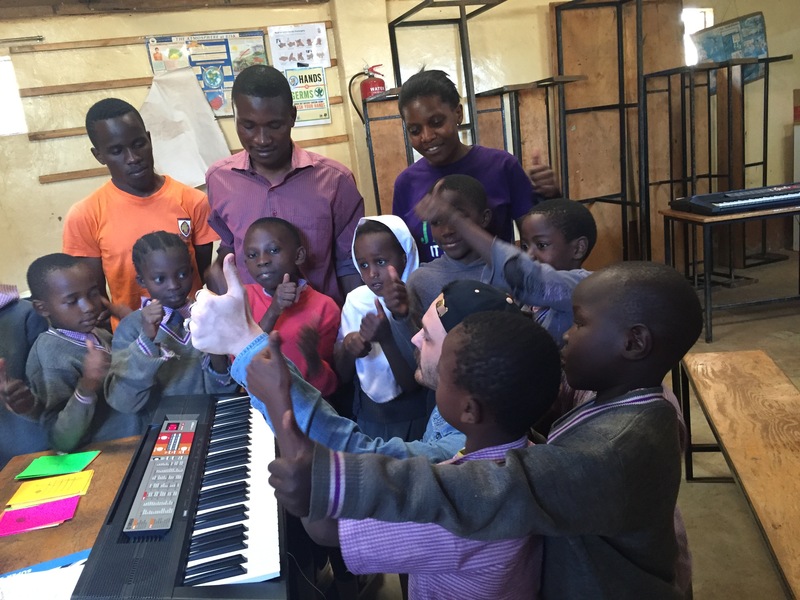 Bill was treated to a performance in class while we met the other staff and some of the kids and had a tour of the premises. Ki’pe’peo was fabulous. 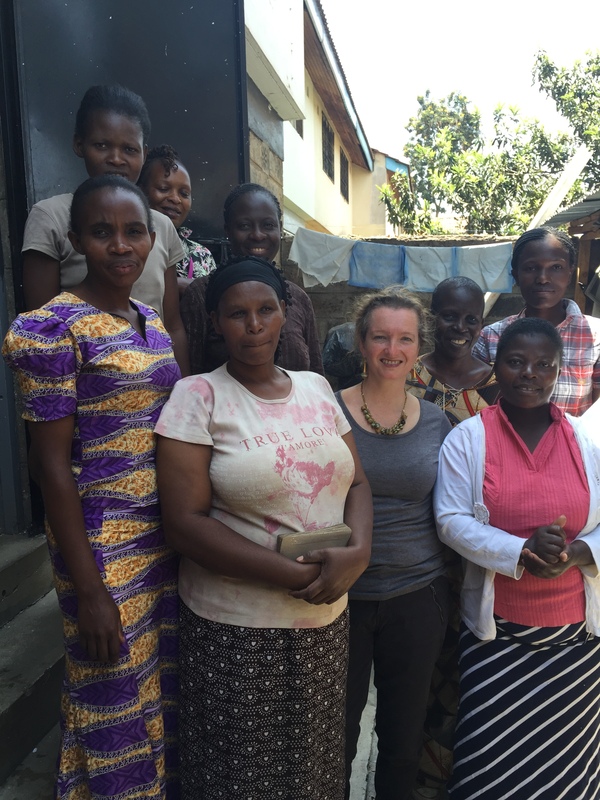 It’s a workshop that employs 17 women of Kibera making cards and jewelry. 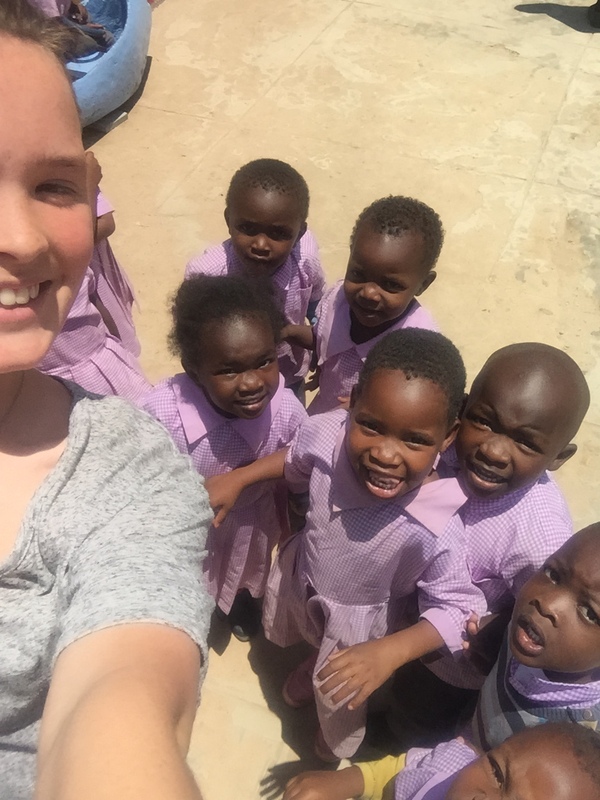 Between them they support 80 children, some their own & some that live with them having become orphaned. 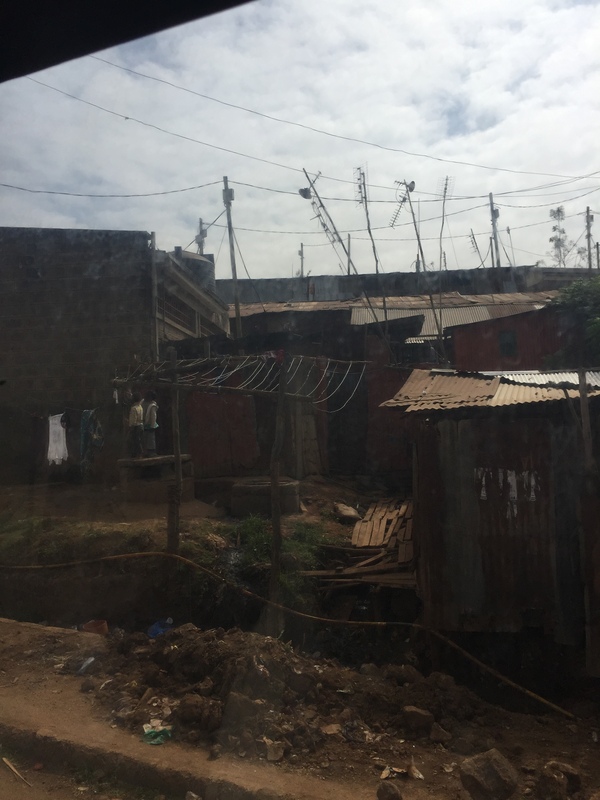 There is no formal adoption process for slum families and it is quite common for children to be brought up by friends, relatives or neighbours where the parents have passed away (or in some cases, just disappeared). We were warmly welcomed by the women, who were thrilled with our delivery of bags of shredded paper that had come with us from West Nairobi School. We watched as they transformed the paper, along with cardboard boxes into gorgeous paper for the cards. The production team works downstairs in the outside courtyard and the design team works in 2 little rooms upstairs. Our kids joined with the kids from the school and helped out upstairs. 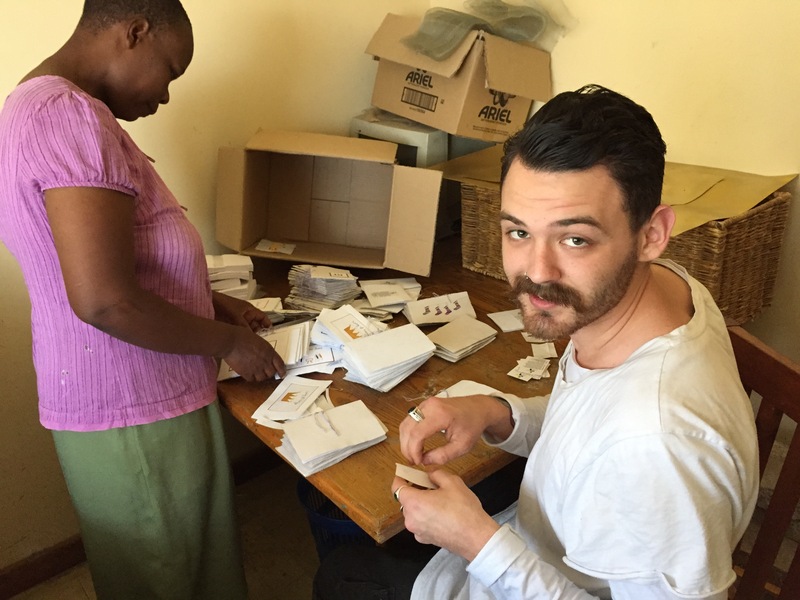 For a couple of hours Zac cut, Jake packaged and Tilly wrote the name of the lady who had created the card onto the little sticker that goes on the back. It’s quite a production line! 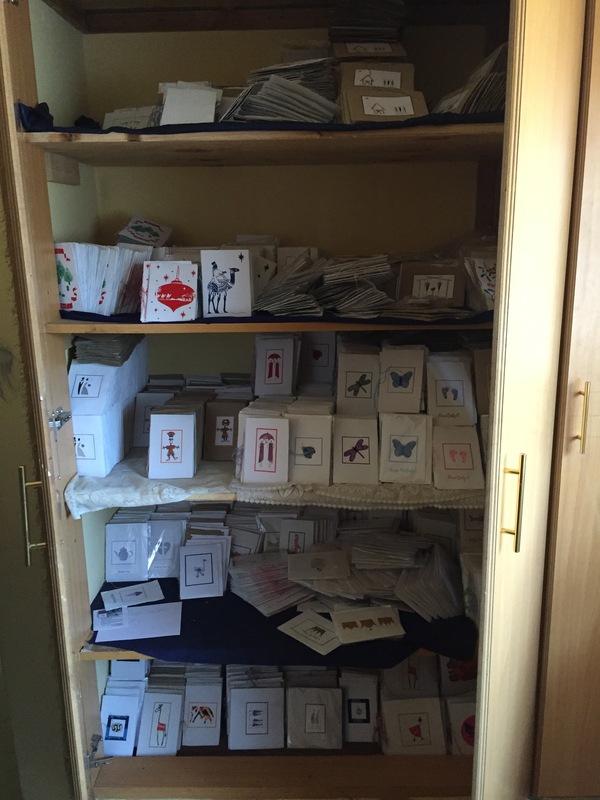 I bought heaps of cards to bring home and also quite a bit of jewelry (which we didn’t see them making today but it all happens on site). The jewellery is mostly made from recycled paper – the best kind is apparently from old calendars as its shiny and colourful! Back on the bus. A bit of a trek to get back to ‘Angel’ to collect the school kids and a bit more of a trek to get back to school – oh the traffic! 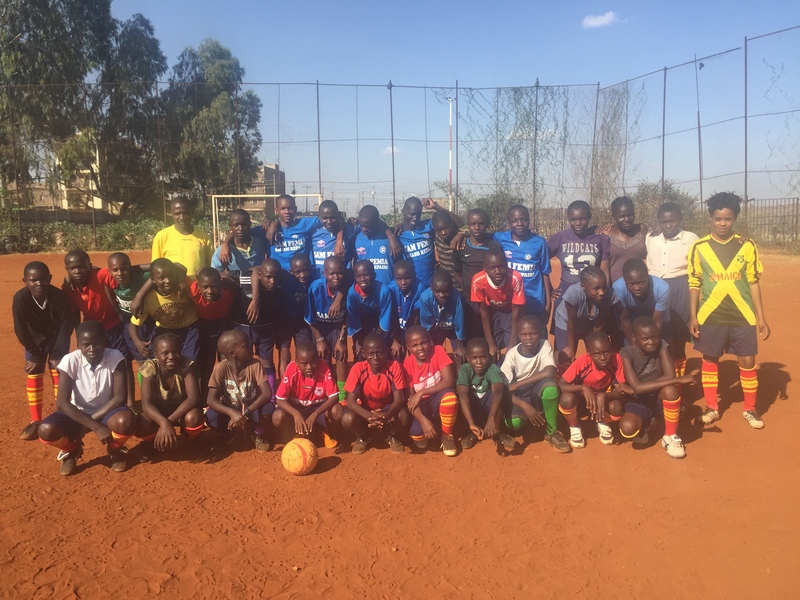 We’d decided to travel with hand luggage for ourselves and use our checked allowance (x 5 of us) to transport soccer boots / shin pads / socks donated by AMS families. 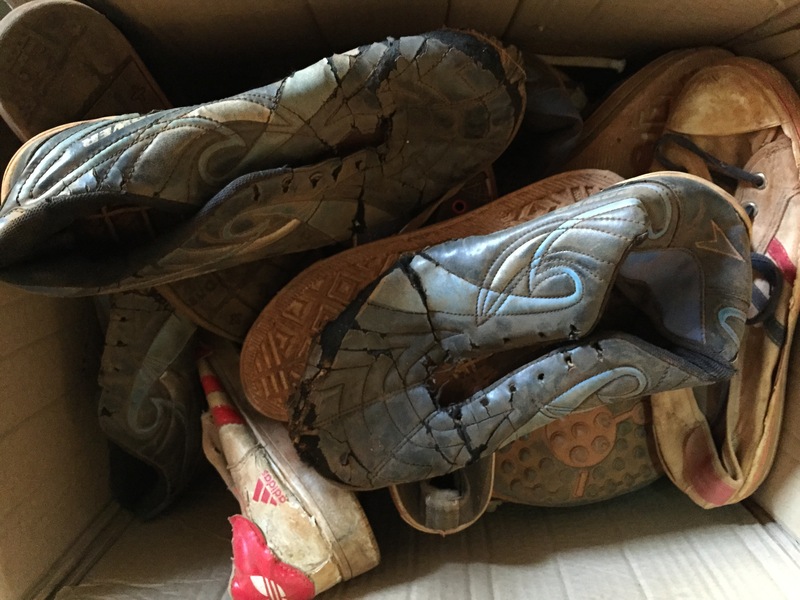 Everyone was very generous – some families actually bought boots then donated them. There are a million colors and sizes – some were so tiny and cute!! 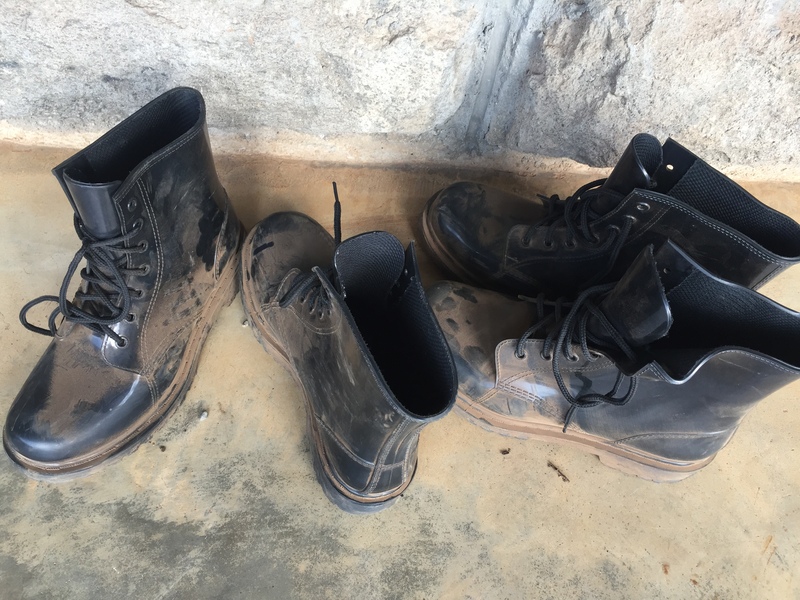 With some help from friends, we’d pretty much managed to scrub, sort & tie up all the boots and started to pack them before we went to camp. Amongst the chaos on Tuesday evening, we managed to pack our things & gaffer tape up all the bags of boots. 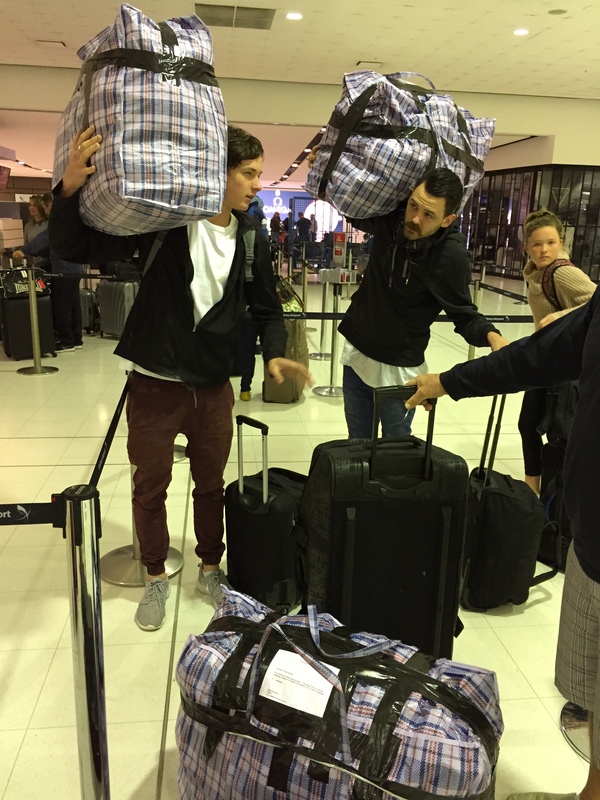 In the end we used every inch of our allowance and weighed over 100kgs of soccer gear in our dining room. We said goodbye to family & friends (and the dog!) and slept for a couple of hours. Up again at 1am to finish off packing and organising. Woke the kids at 2 for our 2.45am shuttle pick up. It hurt quite a bit but we got there! We had a great run with no traffic, no lines at the airport (there is an upside to all this way-too-early stuff) and Mr check in at the Emirates counter was very chuffed to report that there was heaps of room on our flights and shuffled our seats to ensure we would get whole rows to ourselves. We were as delighted as he was! 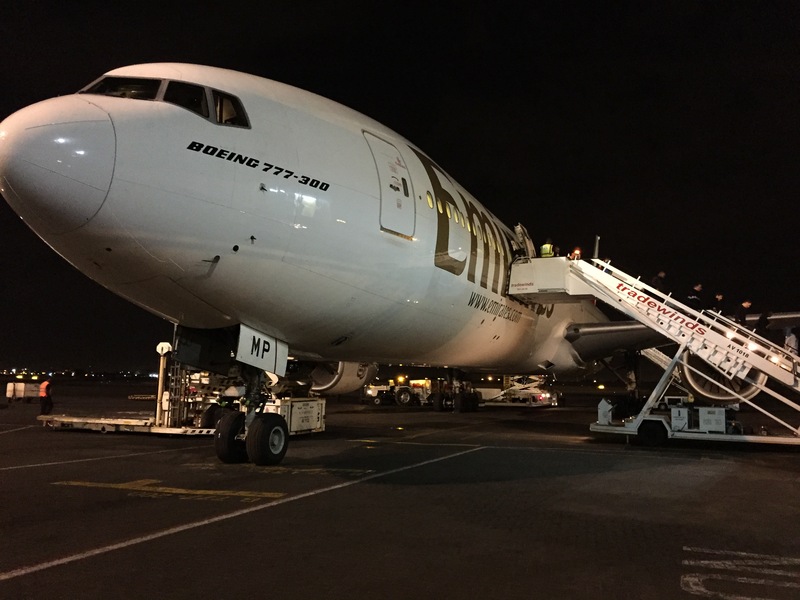 We had a wonderful flight – lots of room & an easy transit through Dubai. 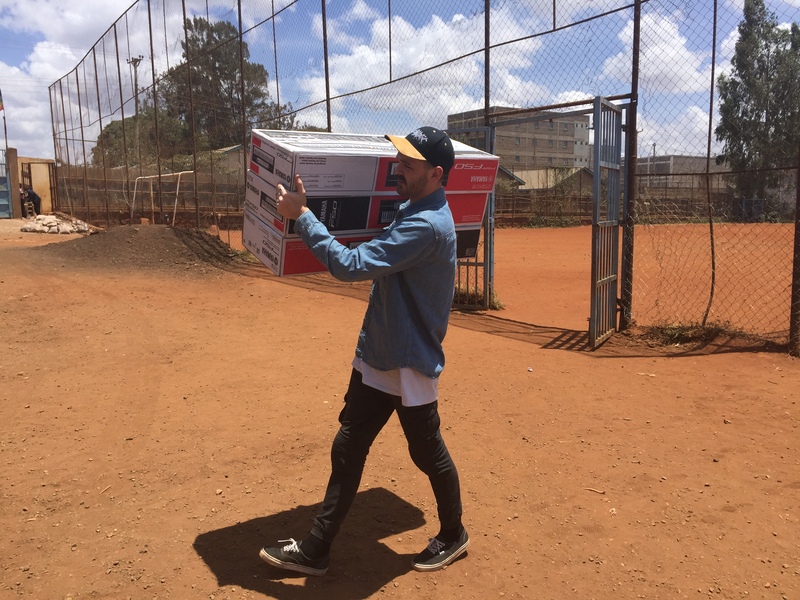 We had one glitch getting our boots through Nairobi customs. Alas, our letter and official documents explaining that these were second hand, had been donated and were going to directly benefit the community of Kibera are no match for the corruption of the lovely customs officers. 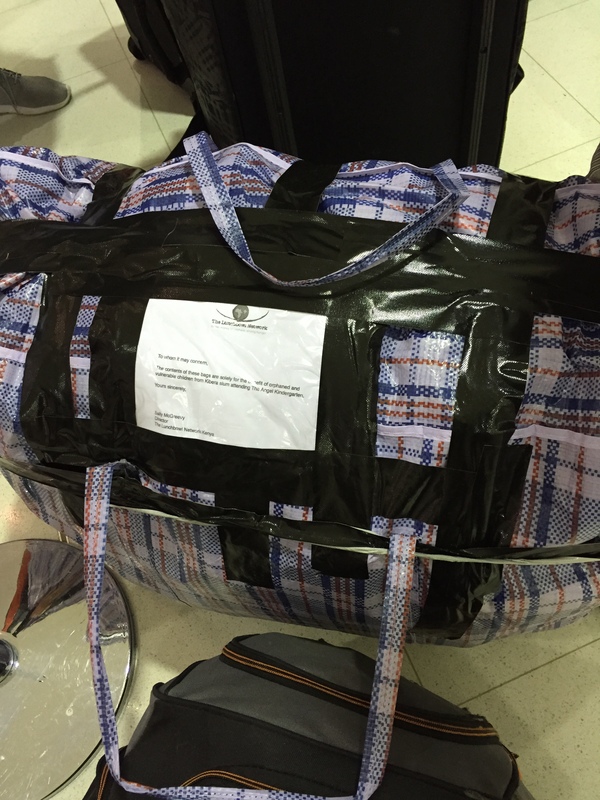 Nothing that $50US didn’t fix – but the corruption still stings even when you expect it! It was quite a long maxi taxi ride from the airport to where we are staying in Karen but there was enough culture shock to keep everyone wake. Showered and fell into bed. (Actually pretty sure Jake and Zac didn’t even shower).